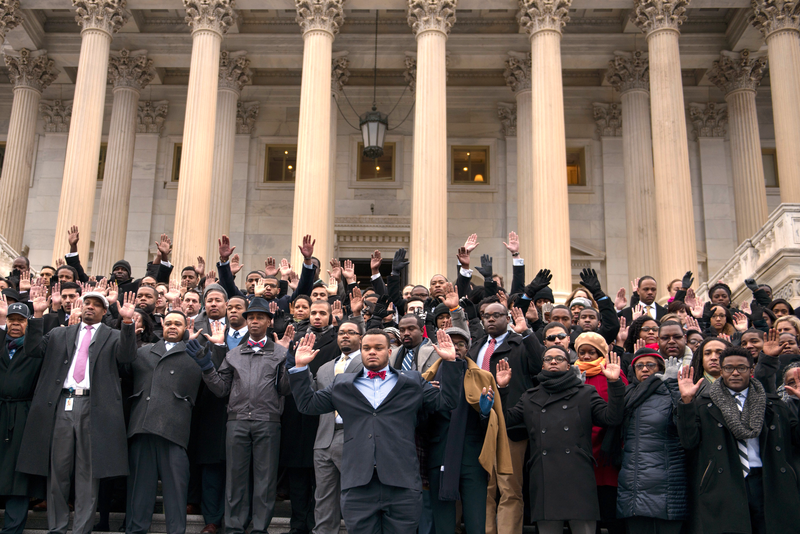 Photo by Brendan Smialowski of Getty Images, showing Congressional staff during a walkout at the Capitol in December 2014. “Every time you see me, you want to mess with me,” Eric Garner told the group of approaching New York City police officers. As they wrestled him to the ground to arrest him for selling untaxed loose cigarettes, an officer placed Garner in a chokehold and maintained his grip despite Garner’s pleas for air. One hour later, Garner was pronounced dead. The unarmed black man’s death and the white officer’s non-indictment despite videotape evidence have heightened concerns about police practices and accountability. In the wake of the fatal police shooting of unarmed teenager Michael Brown in Ferguson, Missouri, and that officer’s non-indictment, a growing number of Americans are outraged and demanding change. “Black lives matter” has become a rallying cry in light of evidence that the criminal justice system is failing to uphold this basic truth. Official data, although woefully inadequate,1)The actual number of police killings was about 45% higher than the FBI’s tally for the nation’s 105 largest police departments between 2007 and 2012, see: Barry, R. & Jones, C. (2014). Hundreds of Police Killings Are Uncounted in Federal Stats. The Wall Street Journal. See also: Fischer-Baum, R. (2014). Nobody Knows How Many Americans The Police Kill Each Year. FiveThirtyEight Politics; Klinger, D. (2014). On the Problems and Promise of Research on Lethal Police Violence: A Research Note. Homicide Studies, 16(1), 78–96. show that over half of those killed by police in recent years have been black or Latino.2)Bureau of Justice Statistics (2011). Arrest-Related Deaths, 2003-2009—Statistical Tables. (p. 6, Tbl. 6). In recent years, police officers have killed African American teenage boys at 21 times the rate of their white counterparts, according to an analysis of the FBI Supplementary Homicide Report, see: Gabrielson, R., Jones, R., & Sagara, E. (2014). Deadly Force, in Black and White. ProPublica. Officers involved in these killings are rarely indicted, much less convicted, for excessive use of force.3)McKinley, J. & Baker, A. (2014). Grand Jury System, With Exceptions, Favors the Police in Fatalities. The New York Times. And official responses to recent protests have spurred further controversy: militarized police forces disrupted public assemblies in Ferguson,4)Gibbons-Neff, T. (2014). Military Veterans See Deeply Flawed Police Response in Ferguson. The Washington Post. and New York City’s police union blamed pro-reform politicians and nonviolent protesters for the killing of two officers by a mentally unstable man.5)Goldenberg, S., Pazmino, G., & Paybarah, A. (2014). Police Union Declares War on de Blasio After Murder of Officers. Capital. Note that police deaths in the line of duty are at a historical low, see: Federal Bureau of Investigation (2014). FBI Releases 2013 Statistics on Law Enforcement Officers Killed and Assaulted, 2014; National Law Enforcement Officers Memorial Fund (2014). Preliminary 2014 Law Enforcement Officer Fatalities Report. Washington, D.C. The criminal justice system’s high volume of contact with people of color is a major cause of African Americans’ disproportionate rate of fatal police encounters, as well as of broader perceptions of injustice in many communities. This briefing paper identifies four key features of the justice system that contribute to its disparate racial impact, and presents recent best practices for targeting these inequities drawn from adult and juvenile justice systems around the country. In many cases, these practices have produced demonstrable results. Policing is by no means the only stage of the justice system that produces racial disparity. Disadvantage accumulating at each step of the process contributes to blacks and Latinos comprising 56% of the incarcerated population, yet only 30% of the U.S. population.6)U.S. Census Bureau (2014). State and County QuickFacts; Carson, E. (2014). Prisoners in 2013. Bureau of Justice Statistics. (p. 8, Tbl. 7); Minton, T. & Golinelli, D. (2014). Jail Inmates at Midyear 2013—Statistical Tables. Bureau of Justice Statistics. (p. 6, Tbl. 2). The roots of this disparity precede criminal justice contact: conditions of socioeconomic inequality contribute to higher rates of some violent and property crimes among people of color. But four features of the justice system exacerbate this underlying inequality, and jurisdictions around the country have addressed each one through recent reforms. Many ostensibly race-neutral policies and laws have a disparate racial impact. Police policies such as “broken windows” and stop, question, and frisk have disproportionately impacted young men of color. Prosecutorial policies, such as plea bargain guidelines that disadvantage blacks and Latinos compound these disparities, as do sentencing laws that dictate harsher punishments for crimes for which people of color are disproportionately arrested. One reform to address this source of disparity in policing is the significant retrenchment of “stop and frisk” in New York City after a court ruled that the policy violated the constitutional rights of blacks and Latinos. Recent legislation reducing the sentencing disparity between the use and distribution of crack versus powder cocaine in California, Missouri, and at the federal level are examples of efforts to tackle sentencing inequalities. Criminal justice practitioners’ use of discretion is – often unintentionally – influenced by racial bias. Racial disparities in traffic stops have diminished on a nationwide basis in recent years, but persist in many jurisdictions. Police officers are more likely to stop black and Hispanic drivers for investigative reasons. Once pulled over, people of color are more likely than whites to be searched, and blacks are more likely than whites to be arrested. In jurisdictions like Ferguson, these patterns hold even though police have a higher “contraband hit rate” when searching white versus black drivers. Prosecutors and judges also often treat blacks and Hispanics more harshly in their charging and sentencing decisions. The Vera Institute of Justice’s work with prosecutors’ offices around the country is one initiative addressing bias in charging decisions by monitoring outcomes and increasing accountability. Similarly, judges in Dorchester, Massachusetts, have worked with police and prosecutors to develop guidelines to reduce racial disparities in charging enhancements for people arrested for drug crimes in a school zone. Key segments of the criminal justice system are underfunded, putting blacks and Latinos – who are disproportionately low-income – at a disadvantage. Most states inadequately fund their indigent defense programs. Pretrial release often requires money bond, which can be prohibitive to low-income individuals and increases the pressure on them to accept less favorable plea deals. Many parole and probation systems offer supervision with little support. Public drug treatment programs are also underfunded, thereby limiting treatment and sentencing alternatives for low-income individuals. New Jersey’s recently overhauled bail laws, which will increase nonmonetary release options, is an effort to create a more even playing field for low-income individuals. In Illinois, the expansion of alternative community programs has helped to nearly halve reliance on secure detention for youth. Criminal justice policies exacerbate socioeconomic inequalities by imposing collateral consequences on those with criminal records and by diverting public spending. A criminal conviction creates a barrier to securing steady employment, and those with felony drug convictions are disqualified from public assistance and public housing in many areas. In addition, allocating public resources to punitive programs comes at the expense of investments in crime prevention and drug treatment programs. Because of their higher rates of incarceration and poverty, people of color are disproportionately affected by these policy choices. A key development in this area is California’s reclassification of a number of low-level offenses from felonies to misdemeanors under Proposition 47 in 2014. This initiative is intended to reduce prison admissions and to spare many low-level offenders the collateral consequences of a felony conviction. The law also redirects a portion of state prison savings – estimated to be $150-$250 million annually – to crime prevention and drug treatment programs. 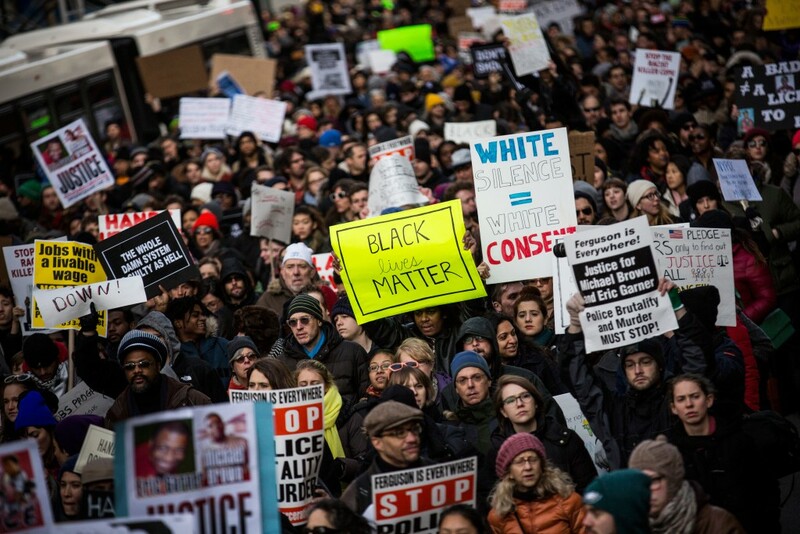 New York City, December 13, 2014: People march in the National March Against Police Violence, which was organized by National Action Network, through the streets of Manhattan on December 13, 2014 in New York City. The march coincided with a march in Washington, D.C. and came on the heels of two grand jury decisions not to indict white police officers in the deaths of two unarmed black men. Photo by Andrew Burton, Getty Images. Recent high-profile killings by police officers demonstrate the need for better police practices and improved accountability. They also underscore the need for revising policies that place people of color under greater police scrutiny and that lead to their disadvantage throughout the criminal justice system. To address this crisis of confidence, especially among people of color, criminal justice practitioners and policymakers should seize this opportunity to adopt and expand upon existing best practices for promoting racial equity at all levels of the justice system. This briefing paper is organized as follows: Section I examines racial disparities in policing in Ferguson, Missouri, and New York City. Section II compares these patterns with nationwide trends and relates them to disparate outcomes at later stages of the criminal justice process. Section III examines the causes of blacks’ and Latinos’ overrepresentation in the justice system, including differential crime rates and the four sources of inequities in the justice system. Section IV presents best practices from around the country for reducing racial disparities created by these four sources. Section V explores strategies for implementation and evaluation. Section VI concludes by reviewing recent achievements and highlighting the need for further reforms. This report largely focuses on the experiences of African Americans / blacks, Latinos / Hispanics, and whites in the justice system. These are the populations for whom the most research and data are available. Nationwide data and research that include Asian Americans and American Indians are more limited: reports often aggregate these groups into one category, labeled “other.” Existing research suggests that many of the trends described in this report hold for American Indians, for sub-groups of Asian Americans, and for other communities of color.7)Franklin, T. W. (2013). Sentencing Native Americans in US Federal Courts: An Examination of Disparity. Justice Quarterly, 30(2), 310–339; Wu, J. & Kim, D. (2014). The Model Minority Myth for Noncitizen Immigration Offenses and Sentencing Outcomes. Race and Justice, 4(4), 303–332; The Muslim American Civil Liberties Coalition, The Creating Law Enforcement Accountability and Responsibility Project, ENDNOTES & The Asian American Legal Defense and Education Fund (2013). Mapping Muslims: NYPD Spying and its Impact on American Muslims. New York, NY. Black and white Americans experience different policing practices. They encounter the police at different rates and for different reasons, and they are treated differently during these encounters. Officers’ racially biased use of discretion – either intentional or unintentional – is one cause of racial disparities in police contact that are not explained by differences in crime rates. Another cause is formal police policies such as “stop and frisk” and “broken windows” policing. Designed to target minor violations with the rationale of circumventing serious crimes, these policies place people of color under greater scrutiny. Officer Darren Wilson stopped Michael Brown for jaywalking. Officer Daniel Pantaleo and his colleagues approached Eric Garner for selling untaxed cigarettes. Disproportionate police contact with people of color in these two very different jurisdictions set the context for these tragic deaths. Source: Office of the Missouri Attorney General (2014). Racial Profiling Data/2013: Ferguson Police Department. Note: Because data are based on stops and not drivers, drivers with multiple stops are counted multiple times. Reasons for stops exceed 100% because some stops were made for multiple reasons. A suburb of St. Louis, Missouri, Ferguson had a population of just over 21,000 in 2013. Though African Americans comprised 63% of the city’s driving-age population in that year, they accounted for 86% of drivers stopped by Ferguson police.8)Office of the Missouri Attorney General (2014). Racial Profiling Data/2013: Ferguson Police Department. Note that data limitations prevent calculating these figures for unique stops: drivers with multiple stops are counted multiple times. That amounted to almost one stop for every two black adults in Ferguson, versus just over one stop for every eight white adults. Ferguson police cited various reasons for stopping black and white drivers. The majority of white drivers (68%) were stopped for a moving violation while the majority of black drivers (57%) were stopped for a license or equipment problem (41% and 16%, respectively). Research has shown that although blacks are more likely than whites to have vehicle code violations, this difference does not account for their disproportionate rates of stops for non-moving violations.9)Epp, C. R., Maynard-Moody, S., & Haider-Markel, D. P. (2014). Pulled Over: How Police Stops Define Race and Citizenship. Chicago, IL: The University of Chicago Press (pp. 58–69). 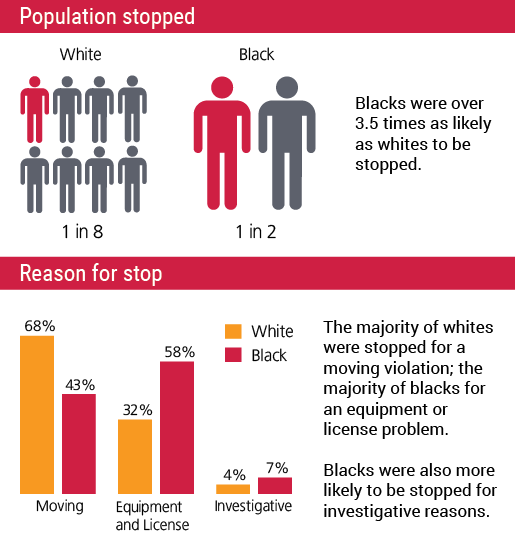 Investigative stops – one of the most discretionary reasons for traffic stops – accounted for 7% of stops among black drivers in Ferguson, compared to 4% of stops among white drivers. Source: Office of the Missouri Attorney General (2014). Racial Profiling Data/2013: Ferguson Police Department. After making a stop, Ferguson police searched 12% of black drivers in contrast to 7% of white drivers. Despite – or as a result of – the high rate of stops and searches for black drivers, police had a lower “contraband hit rate” when searching black drivers compared to white drivers. 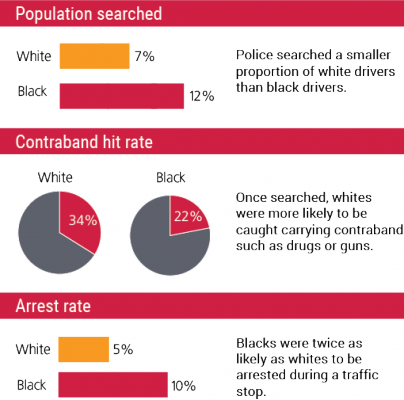 They found contraband – primarily drugs and sometimes weapons – on 22% of black drivers who were searched and on 34% of white drivers who were searched. Yet blacks were twice as likely as whites to be arrested during a traffic stop (10% versus 5%). Two factors account for this disparity. First, by searching such a high proportion of black drivers, officers found contraband on a similar share of black drivers as white drivers (but on a smaller proportion of black drivers that they searched). The more influential factor, though, was that black drivers were more likely to have arrest warrants compared to their white counterparts. Black drivers were more likely to have these warrants in part because of unpaid fines related to their disproportionate exposure to traffic enforcement. Municipalities such as Ferguson may have a fiscal incentive to focus law enforcement efforts on traffic violations and petty offenses. Court fines and fees have become a major source of revenue for certain municipal governments in St. Louis County – primarily those serving largely black populations with a high poverty rate.10)Better Together (2014). Public Safety – Municipal Courts. St. Louis, MO; Downs, R. (2014). ArchCity Defenders: Meet the Legal Superheroes Fighting for St. Louis’ Downtrodden. Riverfront Times; Balko, R. (2014). How Municipalities in St. Louis County, Mo., Profit from Poverty. The Washington Post. Court fines and forfeitures accounted for 20% of Ferguson’s operating revenue in 2013.11)Maciag, M. (2014). Skyrocketing Court Fines Are Major Revenue Generator for Ferguson. Governing. To ensure collection of these court fines and fees, these municipalities have issued a high rate of arrest warrants. Ferguson outpaced all other cities in the region with more than 1,500 warrants per 1,000 people in 2013 – about four times the rate for the city of St. Louis.12)Robles, F. (2014). Ferguson Sets Broad Change for City Courts. The New York Times. See also: ArchCity Defenders (2014). Municipal Courts White Paper. St. Louis, MO. In the aftermath of protests in late summer 2014, the city of Ferguson announced reforms to cap the amount of revenue generated from such tickets.13)Robles (2014), note 12 above. But that promise was short-lived. In December 2014, Ferguson’s finance director announced plans to increase revenues from fines to fill a budget deficit from its most recent fiscal year.14)Smith, K. (2014). Ferguson to Increase Police Ticketing to Close City’s Budget Gap. Bloomberg. Officer Darren Wilson stopped Michael Brown for jaywalking. Officer Daniel Pantaleo and his colleagues approached Eric Garner for selling untaxed cigarettes. Disproportionate police contact with people of color in these two very different jurisdictions set the context for these tragic deaths. Policing in New York City took a dramatic turn in the 1990s under mayor Rudy Giuliani, with the launch of order-maintenance strategies known as “broken windows” and “quality of life” policing. These approaches seek to promote public safety by clamping down on petty offenses and neighborhood disorder.15)Kelling, G. & Wilson, J. (1982). Broken Windows. The Atlantic. On the missing link between perceptions of disorder and crime victimization rates, see: Harcourt, B. & Ludwig, J. (2006). Broken Windows: New Evidence from New York City and a Five-City Social Experiment. University of Chicago Law Review, 73(1), 271–321. For evidence of a link, see: Skogan, W. (1990). Disorder and Decline: Crime and the Spiral of Decay in American Neighborhoods. Berkeley, CA: University of California Press. For a critique, see: Harcourt, B. (2009). Illusion of Order: The False Promise of Broken Windows Policing. Cambridge, MA: Harvard University Press. On how order-maintenance of policing can disrupt informal order maintenance, see: Duneier, M., & Carter, O. (1999). Sidewalk. New York, NY: Farrar, Straus and Giroux. With Michael Bloomberg as mayor (2002-2013) and Raymond Kelly as police commissioner, the police also embarked on a campaign to stop, question, and frisk primarily male residents of neighborhoods populated by low-income people of color – areas thought to have higher crime rates. Many of these “stop and frisk” encounters were initiated with little legitimate rationale: officers noted “furtive movements” as the reason for 44% of stops between 2003 and 2013.16)Dunn, C., LaPlante, S., & Carnig, J. (2014). Stop-and-Frisk Black Lives Matter: Eliminating Racial Inequity in the Criminal Justice System 29 During the Bloomberg Administration (2002-2013). New York, NY: New York Civil Liberties Union. (p. 3). While deemphasizing felony arrests,17)Austin, J. & Jacobson, M. (2013). How New York City Reduced Mass Incarceration: A Model for Change? New York, NY: Vera Institute of Justice. these policies dramatically increased the volume of arrests for misdemeanor offenses, of summonses for violations of the administrative code (such as public consumption of alcohol, disorderly conduct, and bicycling on the sidewalk), and of investigative police encounters with innocent people. Source: Ryley, S., Bult, L., & Gregorian, D. (2014). Exclusive: Daily News Analysis Finds Racial Summons for Minor Violations in ‘Broken Windows’ Policing. New York Daily News. Men of color have borne the brunt of these policies. Men have been over four times as likely as women to be arrested for a misdemeanor in New York City since 1980.18)Chauhan, P., Fera, A. G., Welsh, M. B., Balazon, E, & Misshula, E. (2014). Trends in Misdemeanor Arrests in New York. New York, NY: John Jay College of Criminal Justice. (pp. 25–7). Between 2001 and 2013, 51% of the city’s population over age 16 was black or Hispanic. Yet during that period, 82% of those arrested for misdemeanors were black or Hispanic, as were 81% of those who received summonses.19)Data retrieved from Chauhan et al. (2014), note 18 above; Ryley, S., Bult L., & Gregorian, D. (2014) Exclusive: Daily News Analysis Finds Racial Disparities in Summons for Minor Violations in ‘Broken Windows’ Policing. New York Daily News. Note that individuals with multiple arrests and summonses are counted multiple times in this calculation. Approximately 80% of all misdemeanor arrests were unique arrests in recent years, see: Chauhan et al. (2014), note 18 above (p. 16). The racial composition of stop and frisks was similar.20)New York Civil Liberties Union (2014). Stop-and Frisk Data. New York, NY. Commissioner William Bratton played a crucial role in implementing “broken windows” policies when he led the city’s transit police in 1990 and during his first tenure as police commissioner under Mayor Rudy Giuliani, from 1994 to 1996. Now reappointed, Bratton and Mayor Bill de Blasio remain committed to this style of order-maintenance policing, with Bratton touting its efficacy and explaining that its racial disparities result from targeting communities and populations with higher violent crime rates.21)Bratton, W. & Kelling, G. (2014). The Assault on ‘Broken Windows’ Policing. The Wall Street Journal; Bratton, W. & Kelling, G. (2014). Why We Need Broken Windows Policing. City Journal. In response to the outcry following Garner’s death, Bratton has announced plans to retrain officers on appropriate use of force during these encounters. Yet research shows that order-maintenance strategies have had only a modest impact on serious crime rates. New York City experienced a dramatic crime drop during its period of rising misdemeanor arrests and summonses: the city’s homicide rate declined by 73% between 1990 and 2000.22)Baumer, E. & Wolff, K. (2014). Evaluating Contemporary Crime Drop(s) in America, New York City, and Many Other Places. Justice Quarterly, 31(1), 5–38. But this was not unique; other large cities including Seattle and San Diego have achieved similar reductions in crime since their crack-era crime peaks.23)Baumer & Wolff (2014), note 22 above. Although an early study found that New York City precincts with higher levels of misdemeanor arrests experienced greater drops in serious crimes,24)Kelling, G. & Sousa, W. (2001). Do Police Matter? An Analysis of the Impact of New York City’s Police Reforms. New York, NY: Center for Civic Innovation at the Manhattan Institute. a flawed research design makes this conclusion unreliable25)Zimring, F. (2007). The Great American Crime Decline. New York, NY: Oxford University Press (p. 155); Harcourt & Ludwig (2006), note 15 above. and few other studies have reached the same conclusion.26)See, for example: Messner, S. et al. (2007). Policing, Drugs, and the Homicide Decline in New York City in the 1990s. Criminology, 45(2), 385–414. More recent studies have found that high misdemeanor arrest volume,27)Cerdá, M., et al. (2009). Misdemeanor Policing, Physical Disorder, and Gun-Related Homicide: A Spatial Analytic Test of “Broken-Windows” Theory. Epidemiology, 20(4), 533–41. high summons volume,28)Rosenfeld, R., Fornango, R., & Rengifo, A. (2007). The Impact of Order-Maintenance Policing on New York City Homicide and Robbery Rates: 1988-2000. Criminology, 45(2), 355–384. and other factors,29)Zimring, F. (2007), note 25 above (p. 151); see also Zimring, F. (2012). The City That Became Safe: New York’s Lessons for Urban Crime and its Control. New York, NY: Oxford University Press. have had only a modest association or no association at all30)Harcourt & Ludwig (2006), note 15 above; Greenberg, D. (2013). Studying New York City’s Crime Decline: Methodological Issues. Justice Quarterly, 31(1), 154–188. Another study finds that “situational prevention strategies” rather than misdemeanor arrests helped to lower crime, see: Braga, A. A. & Bond, B. J. (2008). Policing Crime and Disorder Hot Spots: A Randomized Controlled Trial. Criminology, 46(3), 577–607. with the city’s violent crime drop. “Stop and frisk” activity has also been shown to have no impact on precincts’ robbery and burglary rates.31)Rosenfeld, R. & Fornango, R. (2014). The Impact of Police Stops on Precinct Robbery and Burglary Rates in New York City. Justice Quarterly, 31(1), 96-122. Therefore, while order-maintenance policing demands a substantial share of public funds, there is limited evidence to support its efficacy and great cause for concern about its impact.32)Police Reform Organization Project (2014). Over $410 Million a Year: The Human and Economic Cost of Broken-Windows Policing. New York, NY; Schneiderman, E. (2013). A Report on Arrests Arising from the New York City Police Department’s Stop-and-Frisk Practices. New York State Office of the Attorney General; Ghandnoosh, N. (2014). Race and Punishment: Racial Perceptions of Crime and Support for Punitive Policies. Washington, D.C.: The Sentencing Project. (pp. 33–5). Source: Data retrieved from Chauhan, P., Fera, A. G., Welsh, M. B., Balazon, E, & Misshula, E. (2014). Trends in Misdemeanor Arrests in New York. New York, NY: John Jay College of Criminal Justice. (pp.25–7); Ryley, S., Bult, L., & Gregorian, D. (2014). Exclusive: Daily News Analysis Finds Racial Summons for Minor Violations in ‘Broken Windows’ Policing. New York Daily News. Note: Summons and misdemeanor arrest data are based on incidents rather than individuals: individuals with multiple arrests and summonses are counted multiple times. 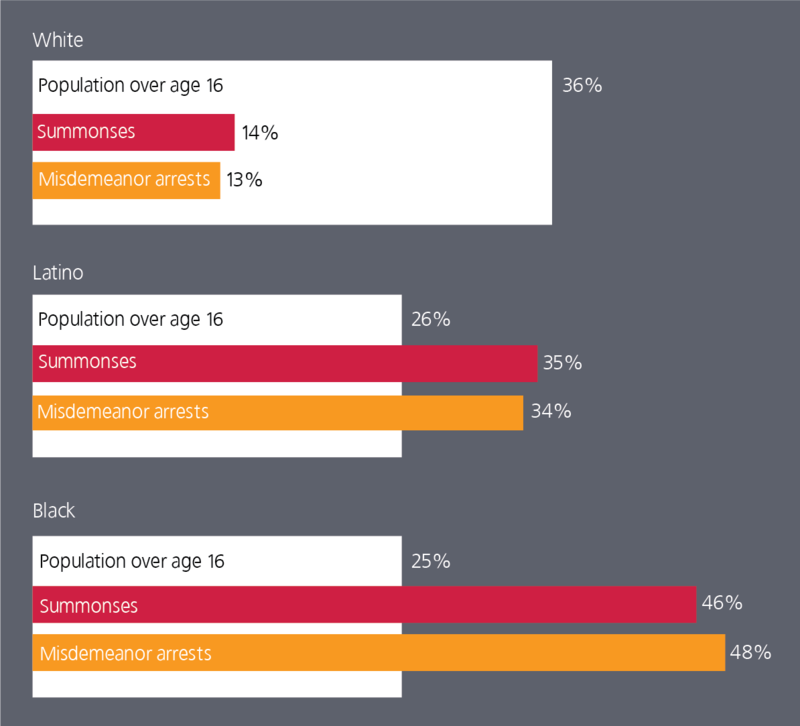 Summons data did not include age breakdown and are drawn from approximately 30% of cases that provided race information. In recent years, nearly equal proportions of blacks, whites, and Latinos in the United States have reported being stopped by the police while on foot or in their cars.33)Langton, L. & Durose, M. (2013). Police Behavior during Traffic and Street Stops, 2011. Bureau of Justice Statistics. (p. 3); Eith, C. & Durose, M. R. (2011). Contacts Between Police and the Public, 2008. Bureau of Justice Statistics. (p. 7). But the causes and outcomes of these stops still differ by race, and staggering racial disparities in rates of police stops persist in certain jurisdictions.34)Cole, D. (1999). No Equal Justice: Race and Class in the Criminal Justice System. New York, NY: The New Press (pp. 34–8). These disparities snowball as individuals traverse the criminal justice system. Compared to nationwide trends, Ferguson’s and New York’s racial disparities in policing are in some ways representative and in others anomalous. Blacks were 31% more likely and Hispanics were 6% more likely than whites to report a recent traffic stop in 2011, although in other recent years a similar proportion of blacks, Latinos, and whites have reported experiencing these stops.35)Langton & Durose (2013), note 33 above; Eith & Durose (2011), note 33 above. Ferguson and New York are two of many jurisdictions where traffic and pedestrian stops still differ significantly by race. A recent investigation of the rates at which the Boston Police Department observed, stopped, interrogated, frisked, or searched individuals without making an arrest found that blacks comprised 63% of these police-civilian encounters between 2007 and 2010, although they made up 24% of the city’s population.36)American Civil Liberties Union Foundation of Massachusetts (2014). Black, Brown and Targeted. Boston, MA; on traffic stops in Chicago, see: American Civil Liberties Union of Illinois (2014). CPD Traffic Stops and Resulting Searches in 2013. Chicago, IL. Similar trends have led approximately 20 cities across the country to enter into consent decrees or memoranda of understanding with the Department of Justice to reduce excessive force and/or protect the public’s civil rights, and several other cities are currently under investigation.37)Domanick, J. (2014). Police Reform’s Best Tool: A Federal Consent Decree. The Crime Report; Eckholm, E. (2014). As Justice Department Scrutinizes Local Police, Cleveland Is Latest Focus. The New York Times; Susman, T. & Queally, J. (2014). Federal Monitor Ordered for Newark Police for Civil Rights Violations. Los Angeles Times. A closer look at the causes of traffic stops reveals that police are more likely to stop black and Hispanic drivers for discretionary reasons. A study of police stops between 2003 and 2004 in Kansas City distinguished between “traffic-safety stops” (reactive stops used to enforce traffic laws or vehicle codes) and “investigatory stops” (proactive stops used to investigate drivers deemed suspicious).38)Epp, Maynard-Moody, & Haider-Markel (2014), note 9 above (pp. 6–9, 59). This study is based on drivers’ reports of officers’ reasons for the stop and traffic-safety stops were defined to include: speeding at greater than seven miles per hour, suspicion of driving under the influence of drugs or alcohol, running a red light, reckless driving, and random roadblock checks for driving under the influence. Investigatory stops were defined to include: failure to signal a turn or lane change, malfunctioning light, driving too slowly, stopping too long, expired license tag, check for valid license or to conduct warrant check, and no justification given for the stop. See also Epp, C. & Maynard-Moody, S. (2014). Driving While Black. Washington Monthly. For nationwide data, see: Langton & Durose (2013), note 33 (p. 4). The authors found that rates of traffic-safety stops did not differ by the driver’s race, but rates of investigatory stops did, and did so significantly. While these differences persisted for all ages, they were sharpest among drivers under age 25: among these drivers, 28% of black men had experienced an investigatory traffic stop, as had 17% of black women, 13% of white men, and 7% of white women. Source: Epp, C. R., Maynard-Moody, S., & Haider-Markel, D. P. (2014). Pulled Over: How Police Stops Define Race and Citizenship. Chicago, IL: The University of Chicago Press (p. 67). Nationwide surveys also reveal disparities in the outcomes of police stops. Once pulled over, black and Hispanic drivers were three times as likely as whites to be searched (6% and 7% versus 2%) and blacks were twice as likely as whites to be arrested during a traffic stop.39)Langton & Durose (2013), note 33 above; Eith & Durose (2011), note 33 above (p. 7). These patterns hold even though police officers generally have a lower “contraband hit rate” when they search black versus white drivers.40)Harris, D. (2012). Hearing on “Ending Racial Profiling in America,” Testimony of David A. Harris. United States Senate Judiciary Committee, Subcommittee on the Constitution, Civil Rights, and Human Rights. (p. 8). A recent investigation of all arrests – not just those resulting from traffic stops – in over 3,500 police departments across the country found that 95% of departments arrested black people at a higher rate than other racial groups.41)Heath, B. (2014). Racial Gap in U.S. Arrest Rates: ‘Staggering Disparity.’ USA Today. The cumulative effect of these policies is that 49% of African American men reported having been arrested by age 23, in contrast to 38% of their non-Hispanic white counterparts.42)Brame, R., Bushway, S. D., Paternoster, R., & Turner, M. G. (2014). Demographic Patterns of Cumulative Arrest Prevalence by Ages 18 and 23. Crime & Delinquency, 60(3), 471–486. The next section of this briefing paper will examine how much of this disparity stems from differential crime rates. The nature of police encounters also differs substantially for people of color compared to whites. Several surveys conducted between 2002 and 2008 have shown that Hispanics were up to twice as likely and blacks were up to three times as likely as whites to experience physical force or its threat during their most recent contact with the police.43)Eith & Durose (2011), note 33 above (pp. 6, 12). More broadly, when a 1999 Gallup survey asked Americans about perceptions of police brutality in their neighborhoods, 58% of people of color said police brutality took place in their area, in contrast to only 35% of whites.44)Gillespie, M. (1999). One Third of Americans Believe Police Brutality Exists in Their Area. Gallup. Police officers’ greater use of discretion when stopping people of color suggests that differences in drivers’ behavior alone are unlikely to account for disparities in use of force. Blacks are more likely than whites to be confined awaiting trial (which increases the probability that an incarcerative sentence will be imposed), to receive incarcerative rather than community sentences, and to receive longer sentences. Racial differences found at each stage are typically modest, but their cumulative effect is significant.46)National Research Council (2014), note 45 above (pp. 93–4). Source: Bonczar, T. (2003). Prevalence of Imprisonment in the U.S. Population, 1974-2001. Bureau of Justice Statistics. (p.1). If recent trends continue, one of every three black teenage boys can expect to go to prison in his lifetime, as can one of every six Latino boys – compared to one of every seventeen white boys.47)Bonczar, T. P. (2003). Prevalence of Imprisonment in the U.S. Population, 1974-2001. Bureau of Justice Statistics. Smaller but still substantial racial and ethnic disparities also persist among women. New York’s and Ferguson’s racial disparities in policing are therefore representative of many aspects of police-citizen encounters around the country. Moreover, policing is not the only stage of the justice system that produces unwarranted racial disparity. Disadvantage accumulates throughout the criminal justice process and contributes to the disproportionate presence of blacks and Latinos in prisons, jails, and under community supervision. The next section presents a closer examination of the causes of these racial disparities. Like an avalanche, racial disparity grows cumulatively as people traverse the criminal justice system. First, a variety of ostensibly race-neutral criminal justice policies in fact have a disparate racial impact. Second, implicit racial bias leads criminal justice practitioners to punish people of color more severely than whites. Third, resource allocation decisions disadvantage low-income defendants, who are disproportionately people of color. Finally, criminal justice policies exacerbate socioeconomic inequalities by imposing collateral consequences on those with criminal records and by diverting public spending away from preventative measures. This section first examines the role of differential crime rates before discussing inequities created by the criminal justice system. People of color are more likely than whites to experience economic disadvantage that is compounded by racial inequality. These forces erode economic and social buffers against crime and contribute to higher rates of certain violent and property crimes – but not drug offenses – among people of color. Source: Cooper. A. & Smith, E. L. Homicide Trends in the United States, 1980-2008. Bureau of Justice Statistics. (p. 13, Figure 19). Blacks and Latinos constituted half of the jail population in 2013.48)Minton & Golinelli (2014), note 6 above (p. 7, Tbl. 3). In 2002, 44% of people in jail lacked a high school degree. In the month prior to their arrest, 29% were unemployed, and 59% reported earning less than $1000/month.49)James, D. (2004). Profile of Jail Inmates, 2002. Bureau of Justice Statistics. Higher rates of geographically concentrated socioeconomic disadvantage contribute to higher rates of certain violent and property crimes among African Americans.50)Peterson, R. & Krivo, L. (2012). Divergent Social World: Neighborhood Crime and the Racial-Spatial Divide. New York, NY: Russell Sage Foundation; Sampson, R. J., Morenoff, J. D., & Raudenbush, S. W. (2005). Social Anatomy of Racial and Ethnic Disparities in Violence. American Journal of Public Health, 95(2), 224–232. In 2012, African Americans represented 13% of the U.S. population. But African Americans comprised 39% of arrests for violent crimes (49% for murder and nonnegligent manslaughter) and 29% of arrests for property crimes. Information gathered from victimization surveys and self-reports of criminal offending suggest that, especially for certain violent crimes and to a lesser extent for property crimes, the race of those arrested resembles those of the people who have committed these crimes.51)See Sampson, R. J. & Lauritsen, J. L. (1997). Racial and Ethnic Disparities in Crime and Criminal Justice in the United States. Crime and Justice, 21, 311–374 (pp. 318–30); D’Alessio, S. & Stolzenberg, L. (2003). Race and the Probability of Arrest. Social Forces, 81(4), 1381–1397; Felson, R., Deane, G., & Armstrong, D. (2008). Do Theories of Crime or Violence Explain Race Differences in Delinquency? Social Science Research, 37(2), 624–641. Blacks and Hispanics are also more likely than whites to be victims of property and violent crimes.52)Bureau of Justice Statistics (2010). Criminal Victimization in the United States, 2008 Statistical Tables. (Tbls. 16, 17 – note that figures do not distinguish by ethnicity and therefore include a sizeable proportion of Hispanics as whites); Bureau of Justice Statistics (2013). Criminal Victimization, 2012. (Tbl. 7). The overall homicide rate for blacks was 6.2 times higher than for whites in 2011.53)Smith, E.L. & Cooper, A. (2011). Homicide in the U.S. Known to Law Enforcement, 2011. Bureau of Justice Statistics. (p. 4 – note figures do not distinguish by ethnicity and therefore include a sizeable proportion of Hispanics as whites). Drug offending does not differ substantially by race. Surveys by federal agencies show that both recently and historically, whites, blacks, and Hispanics have used illicit drugs at roughly similar rates.54)Johnston, L. D., O’Malley, P. M., Bachman, J. G., & Schulenberg, J. E. (2012). Monitoring the Future: National Survey Results on Drug Use, 1975-2012. Ann Arbor, MI: The University of Michigan Institute for Social Research. (Tbls. 4-5, 4-6, and 4-7); U.S. Department of Health and Human Services (2013). Results from the 2013 Survey on Drug Use and Health: Summary of National Findings. (Figure 2.12); Johnston, L.D., O’Malley, P.M., Bachman, J.G., & Schulenberg, J.E. (2013). Demographic Subgroup Trends among Adolescents for Fifty-One Classes of Licit and Illicit Drugs 1975-2012. Ann Arbor, MI: The University of Michigan Institute for Social Research. (Figure 6). Many studies also suggest that drug users generally purchase drugs from people of the same race or ethnicity as them.55)Beckett, K., Nyrop, K., & Pfingst, L. (2006). Race, Drugs, and Policing: Understanding Disparities in Drug Delivery Arrests. Criminology, 44(1), 105–37 (pp. 16–7); Riley, K. J. (1997). Crack, Powder Cocaine, and Heroin: Drug Purchase and Use Patterns in Six Major U.S. Cities. National Institute of Justice. (pp. 15–16). Socioeconomic inequality does lead people of color to disproportionately use and sell drugs outdoors, where they are more readily apprehended by police. But disparities in drug arrests are largely driven by the factors described later in this section. Source: U.S. Department of Health and Human Services (2013). Results from the 2013 Survey on Drug Use and Health: Summary of National Findings. (Figure 2.12). How much of the racial disparity in the prison population stems from crime rates, and how much is produced by the criminal justice system? In recent decades, a number of leading scholars, including Alfred Blumstein and Michael Tonry, have sought to quantify these effects. Over various time periods, these studies concluded that between 61% and 80% of black overrepresentation in prison is explained by higher rates of arrest (as a proxy for involvement in crime).56)Tonry, M. & Melewski, M. (2008). 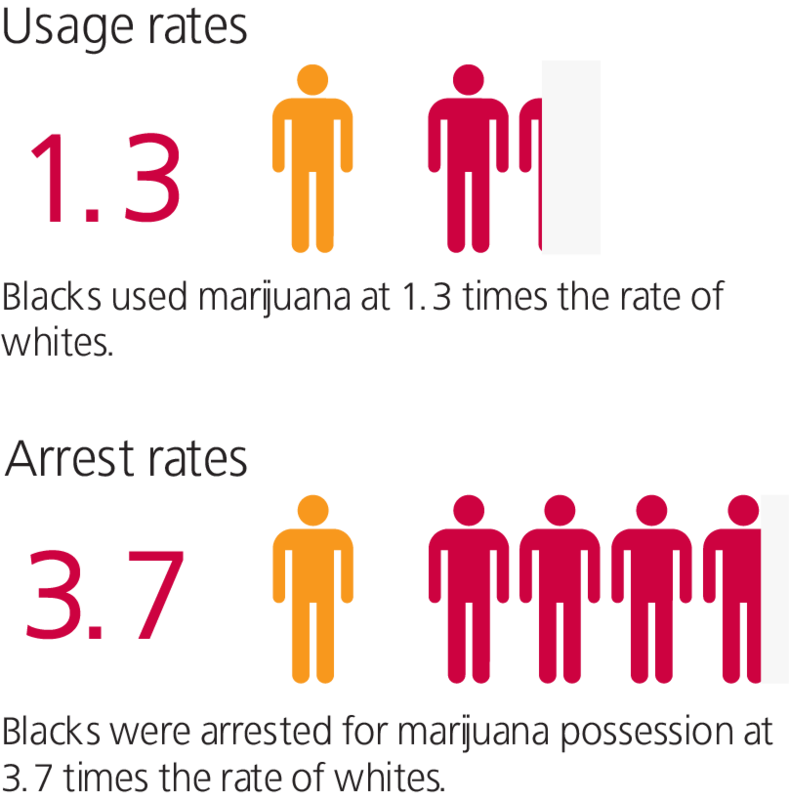 The Malign Effects of Drug and Crime Control Policies on Black Americans. Crime and Justice, 37(1), 1–44 (p. 18); Blumstein, A. (1993). Racial Disproportionality of U.S. Prison Populations Revisited. University of Colorado Law Review, 64, 743–760; Langan, P. A. (1986). Racism on Trial: New Evidence to Explain the Racial Composition of Prisons in the United States. Journal of Criminal Law and Criminology, 76(3), 666–683; Blumstein, A. (1982). On the Racial Disproportionality of United States’ Prison Populations. Journal of Criminal Law and Criminology, 73, 1259–1281. Some of the decline in the proportion of black arrests is caused by the growth of the Latino population, see: Steffensmeier, D., Feldmeyer, B., Harris, C. T., & Ulmer, J. T. (2011). Reassessing Trends in Black Violent Crime, 1980-2008: Sorting Out the “Hispanic Effect” in Uniform Crime Reports Arrests, National Crime Victimization Survey Offender Estimates, and U.S. Prisoner Counts. Criminology, 49(1), 197–251 (pp. 201, 219–22); see also Snyder, H. N. Arrest in the United States, 1980-2009. Bureau of Justice Statistics. The remainder might be caused by racial bias, as well as other factors like differing criminal histories.57)Unwarranted racial disparity in arrests and convictions contributes to people of color being more likely to have prior criminal records, see: Brown, M. K., Carnoy, M., Duster, T., & Oppenheimer, D. B. (2003). Whitewashing Race: The Myth of a Color-Blind Society. Berkeley, CA: University of California Press (pp. 139–47); Mauer, M. (2006). Race to Incarcerate. New York, NY: The New Press (pp. 141–2). Several important nuances, described next, help to interpret these results. Estimates of the extent to which differential crime rates account for disparities in imprisonment rates vary significantly by offense type and geography. In comparing the demographics of the prison population with arrestees, these studies have shown that the least racial disparity exists for the most serious offenses and that the most exists for the least serious offenses (for which arrest rates are also poor proxies for criminal involvement). This is because criminal justice practitioners can exercise greater discretion with less serious crimes. Scholars have also noted that there is wide variation among states in the degree to which arrest disparities explain incarceration disparities.58)See for example, Crutchfield, R. D., Bridges, G. S., & Pitchford, S. R. (1994). Analytical and Aggregation Biases in Analyses of Imprisonment: Reconciling Discrepancies in Studies of Racial Disparity. Journal of Research in Crime and Delinquency, 31, 166–182. The overall conclusion of these studies is that racial differences in criminal offending explain a substantial, but incomplete, portion of the racial differences in the prison population for non-drug crimes. If racial differences in crime rates do not fully account for the high proportion of African Americans in prisons, what else is driving this disparity? Myriad criminal justice policies that appear to be race-neutral collide with broader socioeconomic patterns to create a disparate racial impact. Policing policies and sentencing laws are two key sources of racial inequality. Police policies that cast a wide net in neighborhoods and on populations associated with high crime rates disproportionately affect people of color, as described in Sections I and II. Consequently, people of color are more likely to be arrested even for behavior that they do not engage in at higher rates than whites. This greater level of scrutiny also contributes to higher rates of recidivism among people of color. Almost 1 in 3 people arrested for drug law violations is black, although drug use rates do not differ by race and ethnicity.59)Federal Bureau of Investigation (2014). Crime in the United States 2013; see works cited in note 55 above. An ACLU report found that blacks were 3.7 times more likely to be arrested for marijuana possession than whites in 2010.60)Edwards, E., Bunting, W., Garcia, L. (2013). The War on Marijuana in Black and White. New York, NY: American Civil Liberties Union. This disparity expands at later stages of the criminal justice system so that 57% of people in state prisons for drug offenses are people of color, even though whites comprise over two-thirds of drug users, and are likely a similar proportion of sellers.61)Carson, E. (2014), note 6 above (p. 16, Tbl. 14); Mauer, M. (2009). The Changing Racial Dynamics of the War on Drugs. Washington, D.C.: The Sentencing Project. (p. 8, Tbl. 3). Myriad criminal justice policies that appear to be race-neutral collide with broader socioeconomic patterns to create a disparate racial impact. Sentencing laws that are designed to more harshly punish certain classes of offenses, or to carve out certain groups from harsh penalties, also often have a disparate impact on people of color. This occurs because of how sentencing laws interact with broader racial differences in our society and within the criminal justice system. Drug-free school zone laws mandate sentencing enhancements for people caught selling drugs near school zones. The expansive geographic range of these zones coupled with high urban density has disproportionately affected residents of urban areas, and particularly those in high-poverty areas – who are largely people of color.62)Porter, N. & Clemons, T. (2013). Drug-Free Zone Laws: An Overview of State Policies. Washington, D.C.: The Sentencing Project. A study in New Jersey found that 96% of persons subject to these enhancements in that state were African American or Latino. All 50 states and the District of Columbia have some form of drug-free school zone law. Diversion programs and alternative courts disproportionately bar people of color from alternatives to incarceration because they frequently disqualify people with past convictions.63)Orr, C. H., et al. (2009). America’s Problem-Solving Courts: The Criminal Costs of Treatment and the Case for Reform. Washington, D.C.: National Association of Criminal Defense Lawyers; see also O’Hear, M. (2009). Rethinking Drug Courts: Restorative Justice as a Response to Racial Injustice. Stanford Law & Policy Review, 20(2), 463–500. “Three strikes and you’re out” and other habitual offender laws disproportionately affect people of color who are more likely to have criminal records. Source: Edwards, E. Bunting, W. Garcia, L. (2013). The War on Marijuana in Black and White. New York, NY: American Civil Liberties Union. (p. 47); U.S. Department of Health and Human Services (2011). Results from the 2010 Survey on Drug Use and Health: Detailed Tables. (Tbl. 1.28B). While most white Americans no longer endorse overt and traditional forms of prejudice associated with the era of Jim Crow racism – such as beliefs about the biological inferiority of blacks and support for segregation and discrimination – a nontrivial proportion continue to express negative cultural stereotypes of blacks.64)Many whites also endorse individualistic rather than structural accounts of racial inequality and reject Black Lives Matter: Eliminating Racial Inequity in the Criminal Justice System 31 ameliorative public policies, see: Bobo, L. (2001). Racial Attitudes and Relations at the Close of the Twentieth Century. In Smelser, N. J., Wilson, W. J., & Mitchell, F. (eds.) America Becoming: Racial Trends and Their Consequences, 1, 264–301. Washington, D. C.: National Academy Press (p. 269); Bobo, L. D., Charles, C. Z., Krysan, M., & Simmons, A. D. (2012). The Real Record on Racial Attitudes. In Marsden, P. V. (ed.) Social Trends in American Life: Findings from the General Social Survey since 1972, pp. 38–83. Princeton, NJ: Princeton University Press (Figure 11). Even more common among most white Americans, and many people of color, is implicit racial bias: unintentional and unconscious racial biases that affect decisions and behaviors. Psychological experiments have shown that these biases are pervasive in our society, and are held even by people who disavow overt prejudice.65)Greenwald, A. G., Mcghee, D. E., & Schwartz, J. L. K. (1998). Measuring Individual Differences in Implicit Cognition: The Implicit Association Test. Journal of Personality and Social Psychology, 74(6), 1464–80 (p. 1474); Blair, I. V., et al. (2013). An Assessment of Biases Against Latinos and African Americans Among Primary Care Providers and Community Members. American Journal of Public Health, 103(1), 92–98. Implicit racial biases also permeate the work of criminal justice professionals and influence the deliberation of jurors.66)Rachlinski, J. J., Johnson, S. L., Wistrich, A. J., & Guthrie, C. (2009). Does Unconscious Racial Bias Affect Trial Judges? Notre Dame Law Review, 84(3), 1195–1246 (p. 1210); Eisenberg, T. & Johnson, S. L. (2004). Implicit Racial Attitudes of Death Penalty Lawyers, DePaul Law Review, 1545–55 (pp. 1546–51); Mitchell, T. L., Haw, R. M., Pfeifer, J. E., Meissner, C. A. (2005). Racial Bias in Mock Juror Decision-Making: A Meta-Analytic Review of Defendant Treatment. Law and Human Behavior, 627–28; Sommers, S. R. & Ellsworth, P. C. (2003). How Much Do We Really Know about Race and Juries? A Review of Social Science Theory and Research, Chicago-Kent Law Review, 997–1031. Studies of criminal justice outcomes also reveal that implicit biases influence the decisions of criminal justice professionals. In experimental research such as video simulated shooter studies, subjects are asked to quickly identify and shoot armed suspects, or to press another button to not shoot unarmed suspects. Participants more quickly and accurately decided to shoot an armed target when that person was African American, but more quickly and accurately chose not to shoot if the unarmed target was white.67)Correll, J., Park, B., Judd, C. M., & Wittenbrink, B. (2002). The Police Officer’s Dilemma: Using Ethnicity to Disambiguate Potentially Threatening Individuals. Journal of Personality and Social Psychology, 83(6), 1314–1329. See also Payne, K. B. (2001). Prejudice and Perception: The Role of Automatic and Controlled Processes in Misperceiving a Weapon. Journal of Personality and Social Psychology, 81(2), 181–192; Eberhardt, J. L., Goff, P. A., Purdie, V. J., & Davies, P. G. (2004). Seeing Black: Race, Crime, and Visual Processing. Journal of Personality and Social Psychology, 87(6), 876–93. When researchers conducted this study with a predominantly white group of Denver-based police officers, they found that the officers were less likely than the general public to mistakenly shoot at black unarmed suspects.68)Correll, J., Park, B., Judd, C. M., Wittenbrink, B., Sadler, M. S., & Keesee, T. (2007). Across the Thin Blue Line: Police Officers and Racial Bias in the Decision to Shoot. Journal of Personality and Social Psychology, 92(6), 1006–23; Sadler, M. S., Correll, J., Park, B., & Judd, C. M. (2012). The World Is Not Black and White: Racial Bias in the Decision to Shoot in a Multiethnic Context. Journal of Social Issues, 68(2), 286–313. However, officers more quickly shot at armed black suspects than at armed white suspects. The researchers concluded that while these officers exhibited bias in their speed to shoot, their experience and training reduced bias in their decision to shoot.69)See also: Correll, J., et al. (2014). The Police Officer’s Dilemma: A Decade of Research on Racial Bias in the Decision to Shoot. Social and Personality Psychology Compass, 8(5), 201–213. Studies of criminal justice outcomes also reveal that implicit biases influence the decisions of criminal justice professionals. Researchers have analyzed the extent to which implicit bias affects the work of police officers, prosecutors, judges, and other members of the courtroom work group. Police: As described in Sections I and II, many jurisdictions continue to experience significant racial disparities in police stops. Police have been more likely to pull over people of color for what researchers call investigatory stops. Once pulled over, blacks and Hispanics were three times as likely as whites to be searched, and blacks were twice as likely as whites to be arrested during a traffic stop. Prosecutors: Prosecutors are more likely to charge people of color with crimes that carry heavier sentences than whites.70)Starr, S. B. & Rehavi, M. M. (2013). Mandatory Sentencing and Racial Disparity: Assessing the Role of Prosecutors and the Effects of. The Yale Law Journal, 123(2), 2-80; Crawford, C., Chiricos, T., & Kleck, G. (1998). Race, Racial Threat, and Sentencing of Habitual Offenders. Criminology, 36(3), 481–512. Federal prosecutors, for example, are twice as likely to charge African Americans with offenses that carry mandatory minimum sentences than otherwise-similar whites. State prosecutors are also more likely to charge black rather than similar white defendants under habitual offender laws. Judges: Judges are more likely to sentence people of color than whites to prison and jail and to give them longer sentences, even after accounting for differences in crime severity and criminal history.71)See for example, Steffensmeier, D. & Demuth, S. (2000). Ethnicity and Sentencing Outcomes in U.S. Federal Courts: Who is Punished More Harshly? American Sociological Review, 65(5), 705–729; Steffensmeier, D. & Demuth, S. (2001). Ethnicity and Judges’ Sentencing Decisions: Hispanic-Black-White Comparisons. Criminology, 39(1), 145–178; Spohn, S. C. (2000). Thirty Years of Sentencing Reform: The Quest for a Racially Neutral Sentencing Process. Criminal Justice, 3, 427–501. In federal cases, the sentencing disparities between noncitizens and citizens are even larger than those between people of color and whites.72)Light, M. T., Massoglia, M., & King, R. D. (2014). Citizenship and Punishment: The Salience of National Membership in U.S. Criminal Courts. American Sociological Review, 79(5) 825–847. The race penalty, research from the 1990s revealed, is harshest for certain categories of people and offenses: it particularly affects men and the young, and is more pronounced for less serious offenses. In effect, young black men are perceived as being more dangerous because of their race and socioeconomic characteristics. Other members of the courtroom work group: Unconscious racial bias has been found in many other corners of the criminal justice system. A study in Washington state found that in narrative reports used for sentencing, juvenile probation officers attributed the problems of white youth to their social environments but those of black youth to their attitudes and personalities.73)Hoytt, E. H., Schiraldi, V., Smith, B. V., & Ziedenberg, J. (2001). Reducing Racial Disparities in Juvenile Detention (2001). Baltimore, MD: Annie E. Casey Foundation. Defense attorneys may exhibit racial bias in how they triage their heavy caseloads.74)Rapping, J. A. (2013). Implicitly Unjust: How Defenders Can Affect Systemic Racist Assumptions. New York University Journal of Legislation and Public Policy, 16(4), 999–1048 (pp. 1022–42). Racially diverse juries deliberate longer and more thoroughly than all-white juries, and studies of capital trials have found that all-white juries are more likely than racially diverse juries to sentence individuals to death.75)Sommers, S. R. (2006). On Racial Diversity and Group Decision Making: Identifying Multiple Effects of Racial Composition on Jury Deliberations. Journal of Personality and Social Psychology, 90(4), 597–612; Bowers, W. J., Sandys, M., & Brewer, T. W. (2004). Crossing Racial Boundaries: A Closer Look at the Roots of Racial Bias in Capital Sentencing When the Defendant is Black and the Victim is White. DePaul Law Review, 53(4), 1497–1538. Studies of mock jurors have even shown that people exhibited skin-color bias in how they evaluated evidence: they were more likely to view ambiguous evidence as indication of guilt for darker skinned suspects than for those who were lighter skinned.76)Levinson, J. D. & Young, D. (2010). Different Shades of Bias: Skin Tone, Implicit Racial Bias, and Judgments of Ambiguous Evidence. West Virginia Law Review, 307–350. Finally, an investigation of disparities in school discipline – including rates of out-of-school suspensions and police referrals – led the Departments of Education and Justice to declare that the substantial racial disparities in school discipline “are not explained by more frequent or more serious misbehavior by students of color,” but suggest racial discrimination.77)Civil Rights Division, U.S. Department of Justice & Office for Civil Rights, U.S. Department of Education (2014). Dear Colleague Letter: Nondiscriminatory Administration of School Discipline. Key segments of the criminal justice system are underfunded, leading to worse outcomes for low-income defendants, who are disproportionately people of color. Moreover, many criminal justice policies and practices disadvantage people with limited resources. Over 60% of people in jail are being detained prior to trial.78)Minton & Golinelli (2014), note 6 above (p. 1). Pretrial detention has been shown to increase the odds of conviction, and people who are detained awaiting trial are also more likely to accept less favorable plea deals, to be sentenced to prison, and to receive longer sentences. Seventy percent of pretrial releases require money bond, an especially high hurdle for low-income defendants, who are disproportionately people of color.79)Jones, C. E. (2013). “Give Us Free”: Addressing Racial Disparities in Bail Determinations. New York University Journal of Legislation and Public Policy, 16(4), 919–62 Blacks and Latinos are more likely than whites to be denied bail, to be set a higher money bond, and to be detained because they cannot pay their bond. They are often assessed to be higher safety and flight risks because they are more likely to experience socioeconomic disadvantage and to have criminal records. Implicit bias also contributes to people of color also faring worse than comparable whites in bail determinations. Most states inadequately fund their indigent defense programs. While there are many high-quality public defender offices, in far too many cases indigent individuals are represented by public defenders with excessively high caseloads, or by assigned counsel with limited experience in criminal defense. Certain policies disadvantage lower income individuals, who are disproportionately people of color. Examples include risk assessments that give preference to employed people, or probation or parole requirements to report at locations where there is little public transportation. Due to limitations in publicly funded treatment options, there are fewer sentencing alternatives available to low-income defendants, who cannot afford to pay for treatment programs as an alternative to confinement. Community supervision and reentry programs are underfunded, with too many parole and probation systems offering supervision with little support. Because the criminal justice system is an institution that primarily reacts to – rather than prevents – crime, it is ill-equipped to address many of the underlying causes of crime. But mass incarceration’s hold on vast public resources and the obstacles erected for people with criminal records further erode the economic and social buffers that prevent crime. Reentry is obstructed by the collateral consequences of a criminal conviction. A criminal record creates overwhelming odds against securing steady employment.80)Pager, D. (2007). Marked: Race, Crime, and Finding Work in an Era of Mass Incarceration. Chicago, IL: University of Chicago Press. Moreover, those with felony drug convictions are disqualified from receiving federal cash assistance, food stamps, and publicly subsidized housing in many areas.81)Mauer, M. & McCalmont, V. (2013). A Lifetime of Punishment: The Impact of the Felony Drug Ban on Welfare Benefits. Washington, D.C.: The Sentencing Project. Combined with heightened surveillance, these obstacles contribute to three of four people released from prison arrested within 5 years, and half being re-imprisoned.82)Durose, M., Cooper, A., & Snyder, H. (2014). Recidivism of Prisoners Released in 30 States in 2005: Patterns from 2005 to 2010. Bureau of Justice Statistics. For a discussion of the potential criminogenic effects of high levels of incarceration, see: National Research Council (2014), note 45 above (pp. 288–97). Excessive spending on criminal justice programs limits public funds that can be allocated to crime prevention and drug treatment. Because of their higher rates of incarceration, victimization, and poverty, people of color are disproportionately affected by these shortcomings in policy. These four features have created an unequal justice system. They contribute to blacks’ and Latinos’ high rates of contact with the police and disadvantage them throughout the criminal justice process. Excessive levels of control and punishment, particularly for people of color, are not advancing public safety goals and are damaging families and communities.83)See for example: Goffman, A. (2014) On the Run: Fugitive Life in an American City. Chicago, IL: The University of Chicago Press; Rios, V. M. (2011) Punished: Policing the Lives of Black and Latino Boys. New York, NY: New York University Press; Wakefield, S. & Wildeman, C. (2011). Mass Imprisonment and Racial Disparities in Childhood Behavioral Problems. Criminology & Public Policy, 10, 791–817; Braman, D. 2004. Doing Time on the Outside: Incarceration and Family Life in Urban America. Ann Arbor, MI: University of Michigan Press; Western, B. (2002). The Impact of Incarceration on Wage Mobility and Inequality. American Sociological Review, 67, 526–546. Consequently, although people of color experience more crime than whites, they are less supportive than whites of punitive crime control policies.84)Ghandnoosh (2014), note 32 above. Jurisdictions around the country have implemented reforms to address these sources of inequality. This section showcases best practices from the adult and juvenile justice systems. In many cases, these reforms have produced demonstrable results. Through careful data collection and analysis of racial disparities at various points throughout the criminal justice system, police departments, prosecutor’s offices, courts, and lawmakers have been able to identify and address sources of racial bias. Revise policies with disparate racial impact: Seattle; New York City; Florida’s Miami-Dade and Broward County Public Schools; Los Angeles Unified School District. After criticism and lawsuits about racial disparities in its drug law enforcement, some precincts in and around Seattle have implemented a pre-booking diversion strategy: the Law Enforcement Assisted Diversion program.85)Knafo, S. (2014). Change Of Habit: How Seattle Cops Fought An Addiction To Locking Up Drug Users. The Huffington Post; Law Enforcement Assisted Diversion. The program gives police officers the option of transferring individuals arrested on drug and prostitution charges to social services rather than sending them deeper into the criminal justice system. Successful litigation and the election of a mayor with a reform agenda effectively curbed “stop and frisk” policing in New York City.86)Bostock, M, & Fessenden, F. (2014). ‘Stop-and-Frisk’ Is All but Gone From New York. The New York Times. Mayor Bill de Blasio vowed that his administration would “not break the law to enforce the law” and significantly curbed a policy that was described by a federal judge as one of “indirect racial profiling.”87)Press Office of the Mayor of New York City (2014). Mayor de Blasio Announces Agreement in Landmark Stop-And-Frisk Case; Goldstein, J. (2013). Judge Rejects New York’s Stop-and-Frisk Policy. The New York Times. Thus far, the reform has not had an adverse impact on crime rates.88)Bostock & Fessenden (2014), note 86 above. In a related effort to address disparities in enforcement, the New York City Police Department stated it would no longer make arrests for possession of small amounts of marijuana but would instead treat these cases as non-criminal offenses subject to a fine rather than jail time.89)Goldstein, J. (2014). Marijuana May Mean Ticket, Not Arrest, in New York City. The New York Times. Yet experts worry that this policy does not go far enough to remedy unfair policing practices and may still impose problematic consequences on those who are ticketed.90)Sayegh, G. (2014). Bratton and de Blasio’s Small Step on Pot. New York Daily News; Editorial Board (2014). The Problem with New York’s Marijuana Policy. The New York Times; Thompson, K. (2014). Will Pot Pack New York’s Courts? The New York Times. Several school districts have enacted new school disciplinary policies to reduce racial disparities in out-of-school-suspensions and police referrals. Reforms at Florida’s Miami-Dade and Broward County Public Schools have cut school-based arrests by more than half in five years and significantly reduced suspensions.91)Smiley, D. & Vasquez, M. (2013). Broward, Miami-Dade Work to Close the ‘School-to-Prison Pipeline.’ Miami Herald. In Los Angeles, the school district has nearly eliminated police-issued truancy tickets in the past four years and has enacted new disciplinary policies to reduce reliance on its school police department.92)Watanabe, T. (2013). LAUSD Issuing Far Fewer Truancy Tickets, Report Says. Los Angeles Times; Medina, J. (2014). Los Angeles to Reduce Arrest Rate in Schools. The New York Times. School officials will now deal directly with students who deface property, fight, or get caught with tobacco on school grounds. Several other school districts around the country have begun to implement similar reforms. Revise laws with disparate racial impact: Federal; Indiana; Illinois; Washington, D.C. The Fair Sentencing Act (FSA) of 2010 reduced from 100:1 to 18:1 the weight disparity in the amount of powder cocaine versus crack cocaine that triggers federal mandatory minimum sentences. If passed, the Smarter Sentencing Act would apply these reforms retroactively to people sentenced under the old law. California recently eliminated the crack-cocaine sentencing disparity for certain offenses, and Missouri reduced its disparity. Thirteen states still impose different sentences for crack and cocaine offenses.93)Porter, N. & Wright, V. (2011). Cracked Justice. Washington, D.C.: The Sentencing Project. Indiana amended its drug-free school zone sentencing laws after the state’s Supreme Court began reducing harsh sentences imposed under the law and a university study revealed its negative impact and limited effectiveness. The reform’s components included reducing drug-free zones from 1,000 feet to 500 feet, eliminating them around public housing complexes and youth program centers, and adding a requirement that minors must be reasonably expected to be present when the underlying drug offense occurs. Connecticut, Delaware, Kentucky, Massachusetts, New Jersey, and South Carolina have also amended their laws.94)Porter & Clemons (2013), note 62 above. Through persistent efforts, advocates in Illinois secured the repeal of a 20-year-old law that required the automatic transfer to adult court of 15- and 16-year-olds accused of certain drug offenses within 1,000 feet of a school or public housing. A broad coalition behind the reform emphasized that the law was unnecessary and racially biased, causing youth of color to comprise 99% of those automatically transferred. Following a campaign that emphasized disparate racial enforcement of the law, a ballot initiative in Washington, D.C. may legalize possession of small amounts of marijuana in the district.95)Sebens, S. (2014). Voters Give Nod to Legal Marijuana in Oregon, Alaska, and Washington, D.C. Reuters. Address upstream disparities: New York City; Clayton County, GA. The District Attorney of Brooklyn, New York informed the New York Police Department that he would stop prosecuting minor marijuana arrests so that “individuals, and especially young people of color, do not become unfairly burdened and stigmatized by involvement in the criminal justice system for engaging in non-violent conduct that poses no threat of harm to persons or property.”96)Clifford, S. & Goldstein, J. (2014). Brooklyn Prosecutor Limits When He’ll Target Marijuana. The New York Times. Following a two-year study conducted in partnership with the Vera Institute of Justice, Manhattan’s District Attorney’s office learned that its plea guidelines emphasizing prior arrests created racial disparities in plea offers. The office will conduct implicit bias training for its assistant prosecutors, and is being urged to revise its policy of tying plea offers to arrest histories.97)Kutateladze, B. (2014). Race and Prosecution in Manhattan. New York, NY: Vera Institute of Justice; Editorial Board (2014). How Race Skews Prosecutions. The New York Times. Officials in Clayton County, Georgia reduced school-based juvenile court referrals by creating a system of graduated sanctions to standardize consequences for youth who committed low-level misdemeanor offenses, who comprised the majority of school referrals. The reforms resulted in a 46% reduction in school-based referrals of African American youth. Anticipate disparate impact of new policies: Iowa; Connecticut; Oregon; Minnesota. Iowa, Connecticut, and Oregon have passed legislation requiring a racial impact analysis before codifying a new crime or modifying the criminal penalty for an existing crime. Minnesota’s sentencing commission electively conducts this analysis. This proactive approach of anticipating disparate racial impact could be extended to local laws and incorporated into police policies. Revise risk assessment instruments: Multnomah County, OR; Minnesota’s Fourth Judicial District. Jurisdictions have been able to reduce racial disparities in confinement by documenting racial bias inherent in certain risk assessment instruments (RAI) used for criminal justice decision making. The development of a new RAI in Multnomah County, Oregon led to a greater than 50% reduction in the number of youth detained and a near complete elimination of racial disparity in the proportion of delinquency referrals resulting in detention. Officials examined each element of the RAI through the lens of race and eliminated known sources of bias, such as references to “gang affiliation” since youth of color were disproportionately characterized as gang affiliates often simply due to where they lived. Similarly, a review of the RAI used in consideration of pretrial release in Minnesota’s Fourth Judicial District helped reduce sources of racial bias. Three of the nine indicators in the instrument were found to be correlated with race, but were not significant predictors of pretrial offending or failure to appear in court. As a result, these factors were removed from the instrument. In its comprehensive review of implicit racial bias research, the Kirwan Institute for the Study of Race and Ethnicity concludes that “education efforts aimed at raising awareness about implicit bias can help debias individuals.”98)Staats, C. (2014). State of the Science: Implicit Bias Review 2014. Columbus, OH: Kirwan Institute. (pp. 20–1, 25–6, 33–6); Staats, C. (2013). State of the Science: Implicit Bias Review 2013. Columbus, OH: Kirwan Institute. (pp. 53–63). Their review describes a number of debiasing strategies shown to reduce implicit racial bias in both experimental and non-experimental settings. These include providing exposure to counter-stereotypic imagery, increasing inter-racial contact and diversity, and monitoring outcomes to increase accountability. This section examines recent proposals to reduce bias in policing, as well as how jurisdictions have mitigated the negative impact of implicit bias in later stages of the justice system by establishing objective guidelines to standardize decision making, ensuring that decision-makers have access to the most complete information possible, and providing training on racial bias. Address bias and excessive use of force among police officers: Connecticut; Maryland; Wisconsin; Austin, TX. Many police departments have struggled to recruit and retain persons of color in their ranks. Underrepresentation of people of color presents a barrier to building relationships with the communities they are sworn to serve.101)Dewan, S. (2014). Mostly White Forces in Mostly Black Towns: Police Struggle for Racial Diversity. The New York Times. See also: Ashkenas, J. & Park, H. (2014). The Race Gap in America’s Police Departments. The New York Times. Survey data suggest that black officers may be more mindful than white officers of biased policing. A majority of black officers believe (and a majority of white officers disagree) that police treat whites better than people of color, and agree that police are more likely to use force against people of color than against whites.102)Weisburd, D. & Greenspan, R. (2002). Police Attitudes Toward Abuse of Authority: Findings From a National Study. National Institutes of Justice: Research Brief. (pp. 9–10). Yet a diverse police force alone is unlikely to remedy community-police relations. Studies have reached conflicting conclusions about the relationship between the race of officers and their likelihood of having used force.103)McElvain, J. & Kposowa, A. (2008). Police Officer Characteristics and the Likelihood of Using Deadly Force. Criminal Justice and Behavior, 35(4), 505–521; Alpert, G. & Dunham, R. (2000). Analysis of Police Use-of-Force Data. Washington, D.C.: National Institute of Justice; Geller, W. & Karales, K. (1981). Shootings of and by Chicago Police: Uncommon Crises. Part I: Shootings by Chicago Police. The Journal of Criminal Law and Criminology, 72(4), 1813–1866. Some jurisdictions in the United States and abroad offer improved models for preventing excessive use of force, investigating claims, and ensuring police accountability. Connecticut, Maryland, and Wisconsin have passed laws requiring special prosecutors to handle cases of police misconduct in order to address the potential conflict of interest when local district attorneys prosecute the law enforcement officials with whom they work daily.104)Congressional Research Service (2014). Special Prosecutors: Investigations and Prosecutions of Police Use of Deadly Force; Jawando, M. & Parsons, C. (2014). 4 Ideas That Could Begin to Reform the Criminal Justice System and Improve Police-Community Relations. Washington, D.C.: Center for American Progress; Alcindor, Y. (2014). Wis. bill mandates rules for officer-involved deaths. USA Today. France and Spain have similar laws, requiring independent investigating magistrates for cases involving police use of deadly force.105)Winston, A. (2014). How Special Prosecutors Can Help Bring Police to Justice. Bloomberg Businessweek. Given the considerable leeway given to police on when to use force within the “objectively reasonable” standard set forth by the Supreme Court,106)Alpert, G. & Smith, W. (1994). How Reasonable Is the Reasonable Man? : Police and Excessive Force. Journal of Criminal Law and Criminology, 85(2), 481–501. it is important to create clear guidelines that curb excessive use of force. Germany, for example, provides strict limitations on the use of force for petty offenses.107)Ayres, I. & Markovits, D. (2014). Ending Excessive Police Force Starts with New Rules of Engagement. The Washington Post. A case study of the Austin Police Department recommends a use of force policy that contains clear deadly force and less-lethal force guidelines, extensive police training in all force options, and an early warning system for identifying problem officers.108)Delgado, R. (2011). An Ideal Use of Force Model For Law Enforcement: An Assessment of the Austin Police Department. Applied Research Projects, Texas State University-San Marcos. Once officers are deemed unqualified by their commanders, a process should be established to remove problem officers and prevent those with a history of misconduct from transferring to other departments.109)Dexheimer, E. & Plohetski, T. (2014). Town’s Police Force Highlights Struggle to Track Cops With a History. Austin America-Statesman. In addition, an independent civilian review board with the power to discipline officers should be established to oversee complaints filed by the public. There is currently growing interest in the potential for body cameras worn by officers to reduce their excessive use of force and increase accountability. Following the fatal police shooting in Ferguson, Missouri, President Obama has pledged to allocate $75 million to the purchase of 50,000 body cameras.110)Office of the Press Secretary (2014). Fact Sheet: Strengthening Community Policing. The White House. Research on the effectiveness of these cameras, however, is both limited and mixed. There is some evidence that body cameras can reduce use of force by police, assaults on officers, and citizen complaints, by changing either police or citizen behavior.111)White, M. (2014). Police Officer Body-Worn Cameras: Assessing the Evidence. Washington, D.C.: Office of Community-Oriented Policing Services. Diagnostic Center, Office of Justice Programs; Ariel, B., Farrar, W. A., & Sutherland, A. (2014). The Effect of Police Body-Worn Cameras on Use of Force and Citizens’ Complaints Against the Police: A Randomized Controlled Trial. Journal of Quantitative Criminology; Fossi-Garcia, C. & Lieberman, D. (2014). Investigation of 5 Cities Finds Body Cameras Usually Help Police. Fusion. Yet as the non-indictment of NYPD officer Daniel Pantaleo for Eric Garner’s death suggests, video footage of excessive police force does not ensure accountability. Meanwhile, this technology has raised concerns that body cameras may intrude on citizen privacy and exacerbate trauma among victims of crimes and accidents. Yet a number of civil rights organizations, including the American Civil Liberties Union, have generally expressed support for the use of body cameras, provided that they are governed by strict privacy policies.112)Lovett, I. (2013). In California, a Champion for Police Cameras. The New York Times. This year, Los Angeles will become the first major U.S. city to implement body camera technology widely.113)Mather, K. & Winton, R. (2014). LAPD’s Plan for 7,000 Body Cameras Comes with Challenges. Los Angeles Times. Eliminate racial disparities in charging decisions: Milwaukee County, WI; Mecklenburg County, NC; San Diego County, CA. The Vera Institute of Justice’s Prosecution and Racial Justice program has worked with various jurisdictions to reduce unwarranted racial and ethnic disparities caused by prosecutorial decision making. In Milwaukee, prosecutors previously filed drug paraphernalia charges against 73% of black suspects but only 59% of white suspects.114)Davis, A. J. (2013). In Search of Racial Justice: The Role of the Prosecutor. New York University Journal of Legislation and Public Policy, 16(4), 821–52. The prosecutor’s office was able to eliminate these disparities by reviewing data on outcomes, stressing diversion to treatment or dismissal, and requiring attorneys to consult with supervisors prior to filing such charges. Establish objective criteria and guidelines for decision making: Dorchester, MA; Multnomah County, OR; Saint Louis County, MN. In Dorchester, 52% of people of color arrested in a school zone for a drug crime received an enhanced charge, while only 15% of whites received such a charge. Based on these findings, judicial leadership worked with police and prosecutors to develop guidelines to more fairly handle school zone cases. Similarly, Multnomah County instituted a “sanctions grid” for probation violations that minimized staff inconsistencies, while encouraging youth sanctions other than secure detention. The changes resulted in an immediate reduction in the detention population and were part of a broader effort that largely eliminated the racial disparity in the proportion of referrals resulting in detention. When making bail determinations in Saint Louis County, Minnesota, judges did not have access to a defendant’s bail report, which contained important personal background information, and relied exclusively on the name of the person arrested, the current charge, and the person’s prior criminal history in the state. Local officials perceived the system to be biased against people of color, releasing whites on their own recognizance twice as often as other racial groups, and imposing money bond on African Americans more often and in a greater amount than on whites. Racial disparities remained even when controlling for offense severity level, number of felony charges, and the defendant’s criminal history. Changes were made so that in all felony cases, judges only made bail determinations once a bail report had been provided. The judges also received training on best practices in making bail determinations. Address potential bias among jurors: Northern District of Iowa; North Carolina. U.S. District Court Judge Mark W. Bennett spends 25 minutes discussing implicit bias with the potential jurors in his court.115)Kang, J., et al. (2012). Implicit Bias in the Courtroom. UCLA Law Review, 59, 1124–1186 (pp. 1181–4). He shows video clips that demonstrate bias in hidden camera situations, gives specific instructions on avoiding bias, and asks jurors to sign a pledge. Although the impact of this approach has not been measured, mock jury studies have shown that increasing the salience of race and making jurors more conscious of their biases reduces biased decision making.116)Sommers, S. R. & Ellsworth, P. C. (2001). White Juror Bias: An Investigation of Prejudice Against Black Defendants in the American Courtroom. Psychology, Public Policy, and Law, 7(1), 201–229. North Carolina’s Racial Justice Act enabled commutation of death sentences based on statistical evidence that race had played a role in sentencing. Four death sentences were commuted to life without parole. But as a result of divisive state politics on the issue, the legislature subsequently repealed the law. Investing in alternatives to incarceration and limiting the financial outlays required from defendants have helped to reduce the disadvantage of low-income people of color in the criminal justice system. Increase pretrial release: New Jersey; Cook County, IL. In 2014, New Jersey reformed its bail system to emphasize risk assessment over monetary bail in pretrial release decisions. Previously, all defendants were detained based on their ability to post bail, regardless of their risk level. The new set of laws, which includes a constitutional amendment approved by voters, expands judicial discretion to set the terms of pretrial release and provides judges with broader nonmonetary pretrial release options. Judges may now release lower-risk indigent individuals who cannot afford bail and may deny pretrial release for high-risk individuals.117)American Civil Liberties Union of New Jersey (2014). ACLU-NJ Hails Passage of NJ Bail Reform as Historic Day for Civil Rights. Newark, NJ. All defendants will undergo a risk assessment before their bail hearing and monetary bail may only be set if it is determined that no other conditions of release will assure their appearance in court. In addition, the legislation established time limits to ensure more speedy trials and guarantees defendants the right to counsel at their pretrial detention hearings.118)New Jersey Senate Bill 946 (2014). 216th Session. Appointed counsel is under-resourced and often struggles to gather information supporting pretrial release to present at custody or bail hearings. The Cook County Public Defender’s Office established the Detention Response Unit in 1996 to improve case outcomes for youth of color. The unit consisted of two paralegals who interviewed detained youth prior to their custody hearings. The paralegals helped add a larger social narrative to the court process by checking on community ties and stressing to families the importance of attending the custody hearing. Establish alternatives to incarceration for low-income individuals: Berks County, PA; Illinois; Rock County, WI; Union County, NC. In Berks County, PA, officials were able to reduce the number of youth in secure detention – most of whom were youth of color – by 67% between 2007 and 2012 in part by increasing reliance on alternatives. These included non-secure shelters for youth who cannot safely return home but did not require locked detention, evening reporting centers, electronic monitoring, and expanded use of evidence-based treatment programs. Because many of these youth had committed technical violations of their probation terms, this broader range of alternatives made it possible to keep them out of detention without harming public safety. In 2004, Illinois expanded alternative community programs and decreased reliance on detention. By 2007, detentions had been reduced by 44% across the state’s four pilot sites. The sites created a wide variety of programs, including Aggression Replacement Training, Functional Family Therapy, a community restorative board, teen court, and substance abuse treatment. For every $1 spent on the programs, $3.55 in incarceration costs were avoided. Other jurisdictions have reduced the proportion of youth of color in detention by adopting graduated sanctions for probation violations. In Rock County, WI, graduated sanctions and incentives for probation violators, such as Aggression Replacement Training and evening reporting, helped drop the percentage of youth of color in the total detention population from 71% to 30%. Similarly, in Union County, NC, the use of graduated sanctions for youth who violated probation helped to decrease the representation of youth of color in the total detention population by 32%. Maricopa County significantly improved outcomes in the Driving Under the Influence (DUI) Court, by creating a separate Spanish-speaking court. The court achieved an 88% graduation rate, higher than the 66% rate for participants in English-speaking DUI court. Graduates of the DUI court have to complete at least 20 weeks of treatment, education, and counseling, reach 6 months of sobriety, and be attending school or employed. Santa Cruz County’s probation department addressed difficulties of communicating with Latino families by increasing the number of Spanish-speaking staff to match the proportion of such youth at the detention center. The department also doubled the number of youth diversions by creating programs to meet the needs of Latino youth, designing programs to meet regional needs across the county, and expanding bilingual staff at a local community provider. Overall, these efforts helped lead to a 25% reduction in the average daily detention population, and a simultaneous 22% reduction in the Latino representation in the juvenile hall population. While the criminal justice system is not well-positioned to address the socioeconomic inequality that contributes to differential crime rates, it should not aggravate these conditions.119)Criminal justice professionals and lawmakers can also help to advance effective crime-prevention programs include the following: The Sentencing Project (2013). Ending Mass Incarceration: Social Interventions that Work. Washington, D.C. Advocates have had success in downsizing and redirecting criminal justice spending, increasing utilization of existing resources, and limiting the collateral consequences of criminal convictions. Expand and maximize utilization of available community resources: California; Pima County, AZ. California voters in November 2014 approved Proposition 47, which reclassifies a number of low-level offenses from felonies to misdemeanors.120)California Secretary of State (2014). Prop 47: Criminal Sentences. Misdemeanor Penalties. Official Voter Information Guide. This allows 10,000 incarcerated individuals to petition to have their sentences reduced. Moreover, a significant portion of projected state prison savings each year will be allocated to preventing crime from happening in the first place. This includes investments in mental health and substance abuse treatment, programs to reduce school truancy and prevent dropouts, and support for victim services. Officials and community groups in Pima County, AZ, helped to increase the utilization of community resources by creating geocoded maps to identify communities with high proportions of youth referred to detention and then developing community asset maps to find available program services for at-risk youth in those areas. Limit the collateral consequences of criminal convictions: Numerous states and localities. A criminal record is a strong barrier to employment, and therefore to successful reentry. In 2012, the Equal Employment Opportunity Commission warned employers that they may be liable under Title VII of the Civil Rights Act of 1964 if they uniformly administer “a criminal background check that disproportionately excludes people of a particular race, national origin, or other protected characteristic” when it is not related to the job or necessary for the business.121)U.S. Equal Employment Opportunity Commission (2012). EEOC Enforcement Guidance: Consideration of Arrest and Conviction Records in Employment Decisions Under Title VII of the Civil Rights Act of 1964. On related enforcement struggles, see: Hall, B. (2013). EEOC’S Campaign Against Criminal Background Checks Takes Recent Hits. Employer Law Report; and Berrien, J. (2013). What You Should Know: EEOC’s Response to Letter from State Attorneys General on Use of Criminal Background Checks in Employment. Washington, D.C.: U.S. Equal Employment Opportunity Commission. To reduce barriers to employment for those with criminal records, many jurisdictions have passed laws or issued administrative orders to “Ban the Box” – or remove the question about conviction history from initial job applications and delay a background check until later in the hiring process.122)National Employment Law Project (2015). Ban the Box: Resource Guide. New York, NY. Twelve states – including Maryland, Illinois, and California – and 60 cities – including Atlanta and New York City – have passed these reforms. More broadly, 41 states and the District of Columbia have enacted some form of legislation to reduce collateral consequences.123)Subramanian, R., Moreno, R., & Gebreselassie, S. (2014). Relief in Sight? States Rethink the Collateral Consequences of Criminal Conviction, 2009-2014. New York, NY: Vera Institute of Justice. Advocates have been urging states to end denial of federal cash assistance and food stamp benefits for people convicted in state or federal courts of felony drug offenses. These bans primarily affect low-income women of color.124)Mauer & McCalmont (2013), note 81 above. The 1996 Personal Responsibility and Work Opportunity Reconciliation Act that created the ban also permitted states to opt out or modify its terms. To date, 13 states have fully opted out of the cash assistance ban and nine from the food stamp ban. Others have opted out in part through smaller changes, such as making access dependent on type of drug offense or enrollment in treatment. In recent years, advocates have worked to address housing insecurity for persons with convictions. In 2011, the federal Department of Housing and Urban Development began urging public housing agencies to relax admission policies in an effort to help people released from prison reunite with their families.125)Donovan, S. & Henriquez, S. (2011). Letter to PHA Executive Director. U.S. Department of Housing and Urban Development. Litigation underway in Kansas City and New York City strives to address exclusionary housing policies in the private rental market.126)Navarro, M. (2014). Lawsuit Says Rental Complex in Queens Excludes Ex-Offenders. The New York Times. Since 1997, 23 states, including New Mexico, Rhode Island, and Virginia, have enacted reforms to expand voter eligibility for people with felony convictions.127)Porter, N. (2010). Expanding the Vote: State Felony Disenfranchisement Reform, 1997-2010. Washington, D.C.: The Sentencing Project. Felony disenfranchisement policies have had a disproportionate impact on communities of color, with black adults four times more likely to lose their voting rights than the rest of the adult population.128)Chung, J. (2014). Felony Disenfranchisement: A Primer. Washington, D.C.: The Sentencing Project. Policymakers and practitioners can draw on lessons from these reforms to develop successful implementation strategies and sound evaluation metrics.129)For an elaboration of these points, see Mauer, M. & Ghandnoosh, N. (2014). Incorporating Racial Equity into Criminal Justice Reform. Washington, D.C.: The Sentencing Project. (pp. 1–4, 14–19). All key decision-makers and interested parties – policymakers, practitioners, community groups, and formerly incarcerated individuals – should be included in the development and implementation of reforms. This collective approach can identify sources of disparity, develop solutions and weigh their costs, carry out implementation, and establish monitoring and accountability practices. Institutionalizing reforms in this way can also ensure that they are sustainably funded and implemented. In addition, public education can expand demand and support for reforms. A key question is whether an initiative should be designed to reduce the total number of people of color in the justice system (in absolute count or as a rate) or the relative ratio of racial disparity (a comparison of rates of contact with the justice system). Analyzing the impact of reforms to address racial disparity within the justice system requires not only access to comprehensive data, but also a framework for measuring success. A key question is whether an initiative should be designed to reduce the total number of people of color in the justice system (in absolute count or as a rate) or the relative ratio of racial disparity (a comparison of rates of contact with the justice system). These are both laudable goals, but with potentially very different outcomes. Just as it is possible to reduce the absolute level of imprisonment without reducing racial disparity (for example, if both white and black incarceration rates were equally reduced), so is it possible to reduce racial disparities without affecting incarceration levels (for example, if the white incarceration rate rose while the black incarceration rate remained constant). A recent study of the juvenile justice system illustrates these dynamics. The National Council on Crime and Delinquency analyzed data from five geographically diverse counties engaged in juvenile justice reform in the period 2002–2012, a period when the number of juveniles in residential placement nationally declined by about 40%. The study found that of the juveniles placed in secure confinement during this period, the proportion who were youth of color increased from 12.4% in 2002 to 22.3% in 2012. While it is troubling that the racial disparity has increased, there are nonetheless far fewer African Americans (and whites) behind bars. From the perspective of reducing the consequences of criminal justice control over people of color, such a development has been constructive overall. Despite substantial progress in achieving racial justice in American society over the past half century, racial disparities in the criminal justice system have persisted and worsened in many respects. Among African American men born just after World War II, 15% of those without a high school degree were imprisoned by their mid-30s.130)National Research Council (2014), note 45 above (pp. 67–8). For those born in the 1970s, 68% were imprisoned by their mid-30s. The country has made progress on these issues in recent years. New York and other large states have significantly reduced their prison populations131)Mauer, M. & Ghandnoosh, N. (2014). Fewer Prisoners, Less Crime: A Tale of Three States. Washington, D.C.: The Sentencing Project; Greene, J. & Mauer, M. (2010). Downscaling Prisons: Lessons from Four States. Washington, D.C.: The Sentencing Project. and the juvenile justice system has reduced youth confinement and detention by over 40% since 2001.132)See Sickmund, M., Sladky, T. J., Kang, W., & Puzzanchera, C. (2013). Easy Access to the Census of Juveniles in Residential Placement. Pittsburgh, PA: National Center for Juvenile Justice. The racial gap in incarceration rates has begun to narrow133)Mauer (2009), note 61 above. and police departments in many cities are increasingly diverse.134)Bureau of Justice Statistics (2010). Local Police Departments, 2007. (p. 14, Figure 9). The Garner case has sensitized many white Americans to problems in the justice system, with 47% of whites nationwide and half in New York City stating that the officer should have been indicted.135)Pew Research Center (2014). Sharp Racial Divisions in Reactions to Brown, Garner Decisions. Washington, D.C; Blain, G. (2014). Nearly Two-Thirds of New Yorkers Believe Officer Daniel Pantaleo Should be Charged in the Death of Eric Garner: Poll. New York Daily News. Finally, proper enforcement of the recently reauthorized Death in Custody Reporting Act can ensure accurate data on future police use of lethal force.136)Editorial Board (2014). The Country Should Know How Many People Die in Police Custody. The Washington Post. But demonstrators have echoed Garner’s final words – “I can’t breathe” – and the message attributed to Brown – “hands up, don’t shoot” – in public protests because there is much left to do. As proven by the jurisdictions highlighted in this report, reforms can improve criminal justice outcomes by targeting the four key causes of racial disparity: disparate racial impact of laws and policies, racial bias in the discretion of criminal justice professionals, resource allocation decisions that disadvantage low-income people, and policies that exacerbate socioeconomic inequalities. We must now expand the scale and increase the speed of these efforts. 1. ↑ The actual number of police killings was about 45% higher than the FBI’s tally for the nation’s 105 largest police departments between 2007 and 2012, see: Barry, R. & Jones, C. (2014). Hundreds of Police Killings Are Uncounted in Federal Stats. The Wall Street Journal. See also: Fischer-Baum, R. (2014). Nobody Knows How Many Americans The Police Kill Each Year. FiveThirtyEight Politics; Klinger, D. (2014). On the Problems and Promise of Research on Lethal Police Violence: A Research Note. Homicide Studies, 16(1), 78–96. 2. ↑ Bureau of Justice Statistics (2011). Arrest-Related Deaths, 2003-2009—Statistical Tables. (p. 6, Tbl. 6). In recent years, police officers have killed African American teenage boys at 21 times the rate of their white counterparts, according to an analysis of the FBI Supplementary Homicide Report, see: Gabrielson, R., Jones, R., & Sagara, E. (2014). Deadly Force, in Black and White. ProPublica. 3. ↑ McKinley, J. & Baker, A. (2014). Grand Jury System, With Exceptions, Favors the Police in Fatalities. The New York Times. 4. ↑ Gibbons-Neff, T. (2014). Military Veterans See Deeply Flawed Police Response in Ferguson. The Washington Post. 5. ↑ Goldenberg, S., Pazmino, G., & Paybarah, A. (2014). Police Union Declares War on de Blasio After Murder of Officers. Capital. Note that police deaths in the line of duty are at a historical low, see: Federal Bureau of Investigation (2014). FBI Releases 2013 Statistics on Law Enforcement Officers Killed and Assaulted, 2014; National Law Enforcement Officers Memorial Fund (2014). Preliminary 2014 Law Enforcement Officer Fatalities Report. Washington, D.C.
6. ↑ U.S. Census Bureau (2014). State and County QuickFacts; Carson, E. (2014). Prisoners in 2013. Bureau of Justice Statistics. (p. 8, Tbl. 7); Minton, T. & Golinelli, D. (2014). Jail Inmates at Midyear 2013—Statistical Tables. Bureau of Justice Statistics. (p. 6, Tbl. 2). 7. ↑ Franklin, T. W. (2013). Sentencing Native Americans in US Federal Courts: An Examination of Disparity. Justice Quarterly, 30(2), 310–339; Wu, J. & Kim, D. (2014). The Model Minority Myth for Noncitizen Immigration Offenses and Sentencing Outcomes. Race and Justice, 4(4), 303–332; The Muslim American Civil Liberties Coalition, The Creating Law Enforcement Accountability and Responsibility Project, ENDNOTES & The Asian American Legal Defense and Education Fund (2013). Mapping Muslims: NYPD Spying and its Impact on American Muslims. New York, NY. 8. ↑ Office of the Missouri Attorney General (2014). Racial Profiling Data/2013: Ferguson Police Department. Note that data limitations prevent calculating these figures for unique stops: drivers with multiple stops are counted multiple times. 9. ↑ Epp, C. R., Maynard-Moody, S., & Haider-Markel, D. P. (2014). Pulled Over: How Police Stops Define Race and Citizenship. Chicago, IL: The University of Chicago Press (pp. 58–69). 10. ↑ Better Together (2014). Public Safety – Municipal Courts. St. Louis, MO; Downs, R. (2014). ArchCity Defenders: Meet the Legal Superheroes Fighting for St. Louis’ Downtrodden. Riverfront Times; Balko, R. (2014). How Municipalities in St. Louis County, Mo., Profit from Poverty. The Washington Post. 11. ↑ Maciag, M. (2014). Skyrocketing Court Fines Are Major Revenue Generator for Ferguson. Governing. 12. ↑ Robles, F. (2014). Ferguson Sets Broad Change for City Courts. The New York Times. See also: ArchCity Defenders (2014). Municipal Courts White Paper. St. Louis, MO. 13. ↑ Robles (2014), note 12 above. 14. ↑ Smith, K. (2014). Ferguson to Increase Police Ticketing to Close City’s Budget Gap. Bloomberg. 15. ↑ Kelling, G. & Wilson, J. (1982). Broken Windows. The Atlantic. On the missing link between perceptions of disorder and crime victimization rates, see: Harcourt, B. & Ludwig, J. (2006). Broken Windows: New Evidence from New York City and a Five-City Social Experiment. University of Chicago Law Review, 73(1), 271–321. For evidence of a link, see: Skogan, W. (1990). Disorder and Decline: Crime and the Spiral of Decay in American Neighborhoods. Berkeley, CA: University of California Press. For a critique, see: Harcourt, B. (2009). Illusion of Order: The False Promise of Broken Windows Policing. Cambridge, MA: Harvard University Press. On how order-maintenance of policing can disrupt informal order maintenance, see: Duneier, M., & Carter, O. (1999). Sidewalk. New York, NY: Farrar, Straus and Giroux. 16. ↑ Dunn, C., LaPlante, S., & Carnig, J. (2014). Stop-and-Frisk Black Lives Matter: Eliminating Racial Inequity in the Criminal Justice System 29 During the Bloomberg Administration (2002-2013). New York, NY: New York Civil Liberties Union. (p. 3). 17. ↑ Austin, J. & Jacobson, M. (2013). How New York City Reduced Mass Incarceration: A Model for Change? New York, NY: Vera Institute of Justice. 18. ↑ Chauhan, P., Fera, A. G., Welsh, M. B., Balazon, E, & Misshula, E. (2014). Trends in Misdemeanor Arrests in New York. New York, NY: John Jay College of Criminal Justice. (pp. 25–7). 19. ↑ Data retrieved from Chauhan et al. (2014), note 18 above; Ryley, S., Bult L., & Gregorian, D. (2014) Exclusive: Daily News Analysis Finds Racial Disparities in Summons for Minor Violations in ‘Broken Windows’ Policing. New York Daily News. Note that individuals with multiple arrests and summonses are counted multiple times in this calculation. Approximately 80% of all misdemeanor arrests were unique arrests in recent years, see: Chauhan et al. (2014), note 18 above (p. 16). 20. ↑ New York Civil Liberties Union (2014). Stop-and Frisk Data. New York, NY. 21. ↑ Bratton, W. & Kelling, G. (2014). The Assault on ‘Broken Windows’ Policing. The Wall Street Journal; Bratton, W. & Kelling, G. (2014). Why We Need Broken Windows Policing. City Journal. 22. ↑ Baumer, E. & Wolff, K. (2014). Evaluating Contemporary Crime Drop(s) in America, New York City, and Many Other Places. Justice Quarterly, 31(1), 5–38. 23. ↑ Baumer & Wolff (2014), note 22 above. 24. ↑ Kelling, G. & Sousa, W. (2001). Do Police Matter? An Analysis of the Impact of New York City’s Police Reforms. New York, NY: Center for Civic Innovation at the Manhattan Institute. 25. ↑ Zimring, F. (2007). The Great American Crime Decline. New York, NY: Oxford University Press (p. 155); Harcourt & Ludwig (2006), note 15 above. 26. ↑ See, for example: Messner, S. et al. (2007). Policing, Drugs, and the Homicide Decline in New York City in the 1990s. Criminology, 45(2), 385–414. 27. ↑ Cerdá, M., et al. (2009). Misdemeanor Policing, Physical Disorder, and Gun-Related Homicide: A Spatial Analytic Test of “Broken-Windows” Theory. Epidemiology, 20(4), 533–41. 28. ↑ Rosenfeld, R., Fornango, R., & Rengifo, A. (2007). The Impact of Order-Maintenance Policing on New York City Homicide and Robbery Rates: 1988-2000. Criminology, 45(2), 355–384. 29. ↑ Zimring, F. (2007), note 25 above (p. 151); see also Zimring, F. (2012). The City That Became Safe: New York’s Lessons for Urban Crime and its Control. New York, NY: Oxford University Press. 30. ↑ Harcourt & Ludwig (2006), note 15 above; Greenberg, D. (2013). Studying New York City’s Crime Decline: Methodological Issues. Justice Quarterly, 31(1), 154–188. Another study finds that “situational prevention strategies” rather than misdemeanor arrests helped to lower crime, see: Braga, A. A. & Bond, B. J. (2008). Policing Crime and Disorder Hot Spots: A Randomized Controlled Trial. Criminology, 46(3), 577–607. 31. ↑ Rosenfeld, R. & Fornango, R. (2014). The Impact of Police Stops on Precinct Robbery and Burglary Rates in New York City. Justice Quarterly, 31(1), 96-122. 32. ↑ Police Reform Organization Project (2014). Over $410 Million a Year: The Human and Economic Cost of Broken-Windows Policing. New York, NY; Schneiderman, E. (2013). A Report on Arrests Arising from the New York City Police Department’s Stop-and-Frisk Practices. New York State Office of the Attorney General; Ghandnoosh, N. (2014). Race and Punishment: Racial Perceptions of Crime and Support for Punitive Policies. Washington, D.C.: The Sentencing Project. (pp. 33–5). 33. ↑ Langton, L. & Durose, M. (2013). Police Behavior during Traffic and Street Stops, 2011. Bureau of Justice Statistics. (p. 3); Eith, C. & Durose, M. R. (2011). Contacts Between Police and the Public, 2008. Bureau of Justice Statistics. (p. 7). 34. ↑ Cole, D. (1999). No Equal Justice: Race and Class in the Criminal Justice System. New York, NY: The New Press (pp. 34–8). 35. ↑ Langton & Durose (2013), note 33 above; Eith & Durose (2011), note 33 above. 36. ↑ American Civil Liberties Union Foundation of Massachusetts (2014). Black, Brown and Targeted. Boston, MA; on traffic stops in Chicago, see: American Civil Liberties Union of Illinois (2014). CPD Traffic Stops and Resulting Searches in 2013. Chicago, IL. 37. ↑ Domanick, J. (2014). Police Reform’s Best Tool: A Federal Consent Decree. The Crime Report; Eckholm, E. (2014). As Justice Department Scrutinizes Local Police, Cleveland Is Latest Focus. The New York Times; Susman, T. & Queally, J. (2014). Federal Monitor Ordered for Newark Police for Civil Rights Violations. Los Angeles Times. 38. ↑ Epp, Maynard-Moody, & Haider-Markel (2014), note 9 above (pp. 6–9, 59). This study is based on drivers’ reports of officers’ reasons for the stop and traffic-safety stops were defined to include: speeding at greater than seven miles per hour, suspicion of driving under the influence of drugs or alcohol, running a red light, reckless driving, and random roadblock checks for driving under the influence. Investigatory stops were defined to include: failure to signal a turn or lane change, malfunctioning light, driving too slowly, stopping too long, expired license tag, check for valid license or to conduct warrant check, and no justification given for the stop. See also Epp, C. & Maynard-Moody, S. (2014). Driving While Black. Washington Monthly. For nationwide data, see: Langton & Durose (2013), note 33 (p. 4). 39. ↑ Langton & Durose (2013), note 33 above; Eith & Durose (2011), note 33 above (p. 7). 40. ↑ Harris, D. (2012). Hearing on “Ending Racial Profiling in America,” Testimony of David A. Harris. United States Senate Judiciary Committee, Subcommittee on the Constitution, Civil Rights, and Human Rights. (p. 8). 41. ↑ Heath, B. (2014). Racial Gap in U.S. Arrest Rates: ‘Staggering Disparity.’ USA Today. 42. ↑ Brame, R., Bushway, S. D., Paternoster, R., & Turner, M. G. (2014). Demographic Patterns of Cumulative Arrest Prevalence by Ages 18 and 23. Crime & Delinquency, 60(3), 471–486. 43. ↑ Eith & Durose (2011), note 33 above (pp. 6, 12). 44. ↑ Gillespie, M. (1999). One Third of Americans Believe Police Brutality Exists in Their Area. Gallup. 45. ↑ National Research Council (2014). The Growth of Incarceration in the United States: Exploring Causes and Consequences. Washington, D.C.: The National Academies Press. (pp. 93–4); The Sentencing Project (2013). Report of The Sentencing Project to the United Nations Human Rights Committee: Regarding Racial Disparities in the United States Criminal Justice System. Washington, D.C; see also Crutchfield, R., Fernandes, A., & Martinez, J. (2010). Racial and Ethnic Disparity and Criminal Justice: How Much is Too Much? The Journal of Criminal Law & Criminology, 100(3), 903–932; Bucerius, S. & Tonry, M. (2014). The Oxford Handbook of Ethnicity, Crime, and Immigration. New York, NY: Oxford University Press. (p. 166). 46. ↑ National Research Council (2014), note 45 above (pp. 93–4). 47. ↑ Bonczar, T. P. (2003). Prevalence of Imprisonment in the U.S. Population, 1974-2001. Bureau of Justice Statistics. 48. ↑ Minton & Golinelli (2014), note 6 above (p. 7, Tbl. 3). 49. ↑ James, D. (2004). Profile of Jail Inmates, 2002. Bureau of Justice Statistics. 50. ↑ Peterson, R. & Krivo, L. (2012). Divergent Social World: Neighborhood Crime and the Racial-Spatial Divide. New York, NY: Russell Sage Foundation; Sampson, R. J., Morenoff, J. D., & Raudenbush, S. W. (2005). Social Anatomy of Racial and Ethnic Disparities in Violence. American Journal of Public Health, 95(2), 224–232. 51. ↑ See Sampson, R. J. & Lauritsen, J. L. (1997). Racial and Ethnic Disparities in Crime and Criminal Justice in the United States. Crime and Justice, 21, 311–374 (pp. 318–30); D’Alessio, S. & Stolzenberg, L. (2003). Race and the Probability of Arrest. Social Forces, 81(4), 1381–1397; Felson, R., Deane, G., & Armstrong, D. (2008). Do Theories of Crime or Violence Explain Race Differences in Delinquency? Social Science Research, 37(2), 624–641. 52. ↑ Bureau of Justice Statistics (2010). Criminal Victimization in the United States, 2008 Statistical Tables. (Tbls. 16, 17 – note that figures do not distinguish by ethnicity and therefore include a sizeable proportion of Hispanics as whites); Bureau of Justice Statistics (2013). Criminal Victimization, 2012. (Tbl. 7). 53. ↑ Smith, E.L. & Cooper, A. (2011). Homicide in the U.S. Known to Law Enforcement, 2011. Bureau of Justice Statistics. (p. 4 – note figures do not distinguish by ethnicity and therefore include a sizeable proportion of Hispanics as whites). 54. ↑ Johnston, L. D., O’Malley, P. M., Bachman, J. G., & Schulenberg, J. E. (2012). Monitoring the Future: National Survey Results on Drug Use, 1975-2012. Ann Arbor, MI: The University of Michigan Institute for Social Research. (Tbls. 4-5, 4-6, and 4-7); U.S. Department of Health and Human Services (2013). Results from the 2013 Survey on Drug Use and Health: Summary of National Findings. (Figure 2.12); Johnston, L.D., O’Malley, P.M., Bachman, J.G., & Schulenberg, J.E. (2013). Demographic Subgroup Trends among Adolescents for Fifty-One Classes of Licit and Illicit Drugs 1975-2012. Ann Arbor, MI: The University of Michigan Institute for Social Research. (Figure 6). 55. ↑ Beckett, K., Nyrop, K., & Pfingst, L. (2006). Race, Drugs, and Policing: Understanding Disparities in Drug Delivery Arrests. Criminology, 44(1), 105–37 (pp. 16–7); Riley, K. J. (1997). Crack, Powder Cocaine, and Heroin: Drug Purchase and Use Patterns in Six Major U.S. Cities. National Institute of Justice. (pp. 15–16). 56. ↑ Tonry, M. & Melewski, M. (2008). The Malign Effects of Drug and Crime Control Policies on Black Americans. Crime and Justice, 37(1), 1–44 (p. 18); Blumstein, A. (1993). 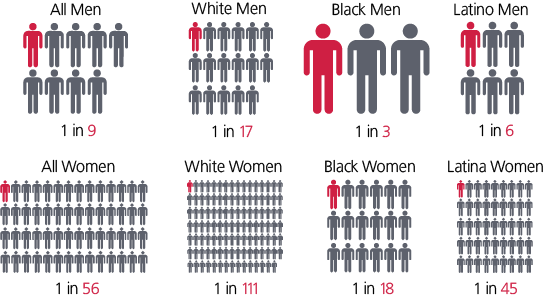 Racial Disproportionality of U.S. Prison Populations Revisited. University of Colorado Law Review, 64, 743–760; Langan, P. A. (1986). Racism on Trial: New Evidence to Explain the Racial Composition of Prisons in the United States. Journal of Criminal Law and Criminology, 76(3), 666–683; Blumstein, A. (1982). On the Racial Disproportionality of United States’ Prison Populations. Journal of Criminal Law and Criminology, 73, 1259–1281. Some of the decline in the proportion of black arrests is caused by the growth of the Latino population, see: Steffensmeier, D., Feldmeyer, B., Harris, C. T., & Ulmer, J. T. (2011). Reassessing Trends in Black Violent Crime, 1980-2008: Sorting Out the “Hispanic Effect” in Uniform Crime Reports Arrests, National Crime Victimization Survey Offender Estimates, and U.S. Prisoner Counts. Criminology, 49(1), 197–251 (pp. 201, 219–22); see also Snyder, H. N. Arrest in the United States, 1980-2009. Bureau of Justice Statistics. 57. ↑ Unwarranted racial disparity in arrests and convictions contributes to people of color being more likely to have prior criminal records, see: Brown, M. K., Carnoy, M., Duster, T., & Oppenheimer, D. B. (2003). Whitewashing Race: The Myth of a Color-Blind Society. Berkeley, CA: University of California Press (pp. 139–47); Mauer, M. (2006). Race to Incarcerate. New York, NY: The New Press (pp. 141–2). 58. ↑ See for example, Crutchfield, R. D., Bridges, G. S., & Pitchford, S. R. (1994). Analytical and Aggregation Biases in Analyses of Imprisonment: Reconciling Discrepancies in Studies of Racial Disparity. Journal of Research in Crime and Delinquency, 31, 166–182. 59. ↑ Federal Bureau of Investigation (2014). Crime in the United States 2013; see works cited in note 55 above. 60. ↑ Edwards, E., Bunting, W., Garcia, L. (2013). The War on Marijuana in Black and White. New York, NY: American Civil Liberties Union. 61. ↑ Carson, E. (2014), note 6 above (p. 16, Tbl. 14); Mauer, M. (2009). The Changing Racial Dynamics of the War on Drugs. Washington, D.C.: The Sentencing Project. (p. 8, Tbl. 3). 62. ↑ Porter, N. & Clemons, T. (2013). Drug-Free Zone Laws: An Overview of State Policies. Washington, D.C.: The Sentencing Project. 63. ↑ Orr, C. H., et al. (2009). America’s Problem-Solving Courts: The Criminal Costs of Treatment and the Case for Reform. Washington, D.C.: National Association of Criminal Defense Lawyers; see also O’Hear, M. (2009). Rethinking Drug Courts: Restorative Justice as a Response to Racial Injustice. Stanford Law & Policy Review, 20(2), 463–500. 64. ↑ Many whites also endorse individualistic rather than structural accounts of racial inequality and reject Black Lives Matter: Eliminating Racial Inequity in the Criminal Justice System 31 ameliorative public policies, see: Bobo, L. (2001). Racial Attitudes and Relations at the Close of the Twentieth Century. In Smelser, N. J., Wilson, W. J., & Mitchell, F. (eds.) America Becoming: Racial Trends and Their Consequences, 1, 264–301. Washington, D. C.: National Academy Press (p. 269); Bobo, L. D., Charles, C. Z., Krysan, M., & Simmons, A. D. (2012). The Real Record on Racial Attitudes. In Marsden, P. V. (ed.) Social Trends in American Life: Findings from the General Social Survey since 1972, pp. 38–83. Princeton, NJ: Princeton University Press (Figure 11). 65. ↑ Greenwald, A. G., Mcghee, D. E., & Schwartz, J. L. K. (1998). Measuring Individual Differences in Implicit Cognition: The Implicit Association Test. Journal of Personality and Social Psychology, 74(6), 1464–80 (p. 1474); Blair, I. V., et al. (2013). An Assessment of Biases Against Latinos and African Americans Among Primary Care Providers and Community Members. American Journal of Public Health, 103(1), 92–98. 66. ↑ Rachlinski, J. J., Johnson, S. L., Wistrich, A. J., & Guthrie, C. (2009). Does Unconscious Racial Bias Affect Trial Judges? Notre Dame Law Review, 84(3), 1195–1246 (p. 1210); Eisenberg, T. & Johnson, S. L. (2004). Implicit Racial Attitudes of Death Penalty Lawyers, DePaul Law Review, 1545–55 (pp. 1546–51); Mitchell, T. L., Haw, R. M., Pfeifer, J. E., Meissner, C. A. (2005). Racial Bias in Mock Juror Decision-Making: A Meta-Analytic Review of Defendant Treatment. Law and Human Behavior, 627–28; Sommers, S. R. & Ellsworth, P. C. (2003). How Much Do We Really Know about Race and Juries? A Review of Social Science Theory and Research, Chicago-Kent Law Review, 997–1031. 67. ↑ Correll, J., Park, B., Judd, C. M., & Wittenbrink, B. (2002). The Police Officer’s Dilemma: Using Ethnicity to Disambiguate Potentially Threatening Individuals. Journal of Personality and Social Psychology, 83(6), 1314–1329. See also Payne, K. B. (2001). Prejudice and Perception: The Role of Automatic and Controlled Processes in Misperceiving a Weapon. Journal of Personality and Social Psychology, 81(2), 181–192; Eberhardt, J. L., Goff, P. A., Purdie, V. J., & Davies, P. G. (2004). Seeing Black: Race, Crime, and Visual Processing. Journal of Personality and Social Psychology, 87(6), 876–93. 68. ↑ Correll, J., Park, B., Judd, C. M., Wittenbrink, B., Sadler, M. S., & Keesee, T. (2007). Across the Thin Blue Line: Police Officers and Racial Bias in the Decision to Shoot. Journal of Personality and Social Psychology, 92(6), 1006–23; Sadler, M. S., Correll, J., Park, B., & Judd, C. M. (2012). The World Is Not Black and White: Racial Bias in the Decision to Shoot in a Multiethnic Context. Journal of Social Issues, 68(2), 286–313. 69. ↑ See also: Correll, J., et al. (2014). The Police Officer’s Dilemma: A Decade of Research on Racial Bias in the Decision to Shoot. Social and Personality Psychology Compass, 8(5), 201–213. 70. ↑ Starr, S. B. & Rehavi, M. M. (2013). Mandatory Sentencing and Racial Disparity: Assessing the Role of Prosecutors and the Effects of. The Yale Law Journal, 123(2), 2-80; Crawford, C., Chiricos, T., & Kleck, G. (1998). Race, Racial Threat, and Sentencing of Habitual Offenders. Criminology, 36(3), 481–512. 71. ↑ See for example, Steffensmeier, D. & Demuth, S. (2000). Ethnicity and Sentencing Outcomes in U.S. Federal Courts: Who is Punished More Harshly? American Sociological Review, 65(5), 705–729; Steffensmeier, D. & Demuth, S. (2001). Ethnicity and Judges’ Sentencing Decisions: Hispanic-Black-White Comparisons. Criminology, 39(1), 145–178; Spohn, S. C. (2000). Thirty Years of Sentencing Reform: The Quest for a Racially Neutral Sentencing Process. Criminal Justice, 3, 427–501. 72. ↑ Light, M. T., Massoglia, M., & King, R. D. (2014). Citizenship and Punishment: The Salience of National Membership in U.S. Criminal Courts. American Sociological Review, 79(5) 825–847. 73. ↑ Hoytt, E. H., Schiraldi, V., Smith, B. V., & Ziedenberg, J. (2001). Reducing Racial Disparities in Juvenile Detention (2001). Baltimore, MD: Annie E. Casey Foundation. 74. ↑ Rapping, J. A. (2013). Implicitly Unjust: How Defenders Can Affect Systemic Racist Assumptions. New York University Journal of Legislation and Public Policy, 16(4), 999–1048 (pp. 1022–42). 75. ↑ Sommers, S. R. (2006). On Racial Diversity and Group Decision Making: Identifying Multiple Effects of Racial Composition on Jury Deliberations. Journal of Personality and Social Psychology, 90(4), 597–612; Bowers, W. J., Sandys, M., & Brewer, T. W. (2004). Crossing Racial Boundaries: A Closer Look at the Roots of Racial Bias in Capital Sentencing When the Defendant is Black and the Victim is White. DePaul Law Review, 53(4), 1497–1538. 76. ↑ Levinson, J. D. & Young, D. (2010). Different Shades of Bias: Skin Tone, Implicit Racial Bias, and Judgments of Ambiguous Evidence. West Virginia Law Review, 307–350. 77. ↑ Civil Rights Division, U.S. Department of Justice & Office for Civil Rights, U.S. Department of Education (2014). Dear Colleague Letter: Nondiscriminatory Administration of School Discipline. 78. ↑ Minton & Golinelli (2014), note 6 above (p. 1). 80. ↑ Pager, D. (2007). Marked: Race, Crime, and Finding Work in an Era of Mass Incarceration. Chicago, IL: University of Chicago Press. 81. ↑ Mauer, M. & McCalmont, V. (2013). A Lifetime of Punishment: The Impact of the Felony Drug Ban on Welfare Benefits. Washington, D.C.: The Sentencing Project. 82. ↑ Durose, M., Cooper, A., & Snyder, H. (2014). Recidivism of Prisoners Released in 30 States in 2005: Patterns from 2005 to 2010. Bureau of Justice Statistics. For a discussion of the potential criminogenic effects of high levels of incarceration, see: National Research Council (2014), note 45 above (pp. 288–97). 83. ↑ See for example: Goffman, A. (2014) On the Run: Fugitive Life in an American City. Chicago, IL: The University of Chicago Press; Rios, V. M. (2011) Punished: Policing the Lives of Black and Latino Boys. New York, NY: New York University Press; Wakefield, S. & Wildeman, C. (2011). Mass Imprisonment and Racial Disparities in Childhood Behavioral Problems. Criminology & Public Policy, 10, 791–817; Braman, D. 2004. Doing Time on the Outside: Incarceration and Family Life in Urban America. Ann Arbor, MI: University of Michigan Press; Western, B. (2002). The Impact of Incarceration on Wage Mobility and Inequality. American Sociological Review, 67, 526–546. 84. ↑ Ghandnoosh (2014), note 32 above. 85. ↑ Knafo, S. (2014). Change Of Habit: How Seattle Cops Fought An Addiction To Locking Up Drug Users. The Huffington Post; Law Enforcement Assisted Diversion. 86. ↑ Bostock, M, & Fessenden, F. (2014). ‘Stop-and-Frisk’ Is All but Gone From New York. The New York Times. 87. ↑ Press Office of the Mayor of New York City (2014). Mayor de Blasio Announces Agreement in Landmark Stop-And-Frisk Case; Goldstein, J. (2013). Judge Rejects New York’s Stop-and-Frisk Policy. The New York Times. 88. ↑ Bostock & Fessenden (2014), note 86 above. 89. ↑ Goldstein, J. (2014). Marijuana May Mean Ticket, Not Arrest, in New York City. The New York Times. 90. ↑ Sayegh, G. (2014). Bratton and de Blasio’s Small Step on Pot. New York Daily News; Editorial Board (2014). The Problem with New York’s Marijuana Policy. The New York Times; Thompson, K. (2014). Will Pot Pack New York’s Courts? The New York Times. 91. ↑ Smiley, D. & Vasquez, M. (2013). Broward, Miami-Dade Work to Close the ‘School-to-Prison Pipeline.’ Miami Herald. 92. ↑ Watanabe, T. (2013). LAUSD Issuing Far Fewer Truancy Tickets, Report Says. Los Angeles Times; Medina, J. (2014). Los Angeles to Reduce Arrest Rate in Schools. The New York Times. 93. ↑ Porter, N. & Wright, V. (2011). Cracked Justice. Washington, D.C.: The Sentencing Project. 94. ↑ Porter & Clemons (2013), note 62 above. 95. ↑ Sebens, S. (2014). Voters Give Nod to Legal Marijuana in Oregon, Alaska, and Washington, D.C. Reuters. 96. ↑ Clifford, S. & Goldstein, J. (2014). Brooklyn Prosecutor Limits When He’ll Target Marijuana. The New York Times. 97. ↑ Kutateladze, B. (2014). Race and Prosecution in Manhattan. New York, NY: Vera Institute of Justice; Editorial Board (2014). How Race Skews Prosecutions. The New York Times. 98. ↑ Staats, C. (2014). State of the Science: Implicit Bias Review 2014. Columbus, OH: Kirwan Institute. (pp. 20–1, 25–6, 33–6); Staats, C. (2013). State of the Science: Implicit Bias Review 2013. Columbus, OH: Kirwan Institute. (pp. 53–63). 99. ↑ See notes 68 and 69 above. 100. ↑ Sim, J., Correll, J., & Sadler, M. (2013). Understanding Police and Expert Performance: When Training Attenuates (vs. Exacerbates) Stereotypic Bias in the Decision to Shoot. Personality and Social Psychology Bulletin, 39(3), 291–304. 101. ↑ Dewan, S. (2014). Mostly White Forces in Mostly Black Towns: Police Struggle for Racial Diversity. The New York Times. See also: Ashkenas, J. & Park, H. (2014). The Race Gap in America’s Police Departments. The New York Times. 102. ↑ Weisburd, D. & Greenspan, R. (2002). Police Attitudes Toward Abuse of Authority: Findings From a National Study. National Institutes of Justice: Research Brief. (pp. 9–10). 103. ↑ McElvain, J. & Kposowa, A. (2008). Police Officer Characteristics and the Likelihood of Using Deadly Force. Criminal Justice and Behavior, 35(4), 505–521; Alpert, G. & Dunham, R. (2000). Analysis of Police Use-of-Force Data. Washington, D.C.: National Institute of Justice; Geller, W. & Karales, K. (1981). Shootings of and by Chicago Police: Uncommon Crises. Part I: Shootings by Chicago Police. The Journal of Criminal Law and Criminology, 72(4), 1813–1866. 104. ↑ Congressional Research Service (2014). Special Prosecutors: Investigations and Prosecutions of Police Use of Deadly Force; Jawando, M. & Parsons, C. (2014). 4 Ideas That Could Begin to Reform the Criminal Justice System and Improve Police-Community Relations. Washington, D.C.: Center for American Progress; Alcindor, Y. (2014). Wis. bill mandates rules for officer-involved deaths. USA Today. 105. ↑ Winston, A. (2014). How Special Prosecutors Can Help Bring Police to Justice. Bloomberg Businessweek. 106. ↑ Alpert, G. & Smith, W. (1994). How Reasonable Is the Reasonable Man? : Police and Excessive Force. Journal of Criminal Law and Criminology, 85(2), 481–501. 107. ↑ Ayres, I. & Markovits, D. (2014). Ending Excessive Police Force Starts with New Rules of Engagement. The Washington Post. 108. ↑ Delgado, R. (2011). An Ideal Use of Force Model For Law Enforcement: An Assessment of the Austin Police Department. Applied Research Projects, Texas State University-San Marcos. 109. ↑ Dexheimer, E. & Plohetski, T. (2014). Town’s Police Force Highlights Struggle to Track Cops With a History. Austin America-Statesman. 110. ↑ Office of the Press Secretary (2014). Fact Sheet: Strengthening Community Policing. The White House. 111. ↑ White, M. (2014). Police Officer Body-Worn Cameras: Assessing the Evidence. Washington, D.C.: Office of Community-Oriented Policing Services. Diagnostic Center, Office of Justice Programs; Ariel, B., Farrar, W. A., & Sutherland, A. (2014). The Effect of Police Body-Worn Cameras on Use of Force and Citizens’ Complaints Against the Police: A Randomized Controlled Trial. Journal of Quantitative Criminology; Fossi-Garcia, C. & Lieberman, D. (2014). Investigation of 5 Cities Finds Body Cameras Usually Help Police. Fusion. 112. ↑ Lovett, I. (2013). In California, a Champion for Police Cameras. The New York Times. 113. ↑ Mather, K. & Winton, R. (2014). LAPD’s Plan for 7,000 Body Cameras Comes with Challenges. Los Angeles Times. 114. ↑ Davis, A. J. (2013). In Search of Racial Justice: The Role of the Prosecutor. New York University Journal of Legislation and Public Policy, 16(4), 821–52. 115. ↑ Kang, J., et al. (2012). Implicit Bias in the Courtroom. UCLA Law Review, 59, 1124–1186 (pp. 1181–4). 116. ↑ Sommers, S. R. & Ellsworth, P. C. (2001). White Juror Bias: An Investigation of Prejudice Against Black Defendants in the American Courtroom. Psychology, Public Policy, and Law, 7(1), 201–229. 117. ↑ American Civil Liberties Union of New Jersey (2014). ACLU-NJ Hails Passage of NJ Bail Reform as Historic Day for Civil Rights. Newark, NJ. 118. ↑ New Jersey Senate Bill 946 (2014). 216th Session. 119. ↑ Criminal justice professionals and lawmakers can also help to advance effective crime-prevention programs include the following: The Sentencing Project (2013). Ending Mass Incarceration: Social Interventions that Work. Washington, D.C.
120. ↑ California Secretary of State (2014). Prop 47: Criminal Sentences. Misdemeanor Penalties. Official Voter Information Guide. 121. ↑ U.S. Equal Employment Opportunity Commission (2012). EEOC Enforcement Guidance: Consideration of Arrest and Conviction Records in Employment Decisions Under Title VII of the Civil Rights Act of 1964. On related enforcement struggles, see: Hall, B. (2013). EEOC’S Campaign Against Criminal Background Checks Takes Recent Hits. Employer Law Report; and Berrien, J. (2013). What You Should Know: EEOC’s Response to Letter from State Attorneys General on Use of Criminal Background Checks in Employment. Washington, D.C.: U.S. Equal Employment Opportunity Commission. 122. ↑ National Employment Law Project (2015). Ban the Box: Resource Guide. New York, NY. 123. ↑ Subramanian, R., Moreno, R., & Gebreselassie, S. (2014). Relief in Sight? States Rethink the Collateral Consequences of Criminal Conviction, 2009-2014. New York, NY: Vera Institute of Justice. 124. ↑ Mauer & McCalmont (2013), note 81 above. 125. ↑ Donovan, S. & Henriquez, S. (2011). Letter to PHA Executive Director. U.S. Department of Housing and Urban Development. 126. ↑ Navarro, M. (2014). Lawsuit Says Rental Complex in Queens Excludes Ex-Offenders. The New York Times. 127. ↑ Porter, N. (2010). Expanding the Vote: State Felony Disenfranchisement Reform, 1997-2010. Washington, D.C.: The Sentencing Project. 128. ↑ Chung, J. (2014). Felony Disenfranchisement: A Primer. Washington, D.C.: The Sentencing Project. 129. ↑ For an elaboration of these points, see Mauer, M. & Ghandnoosh, N. (2014). Incorporating Racial Equity into Criminal Justice Reform. Washington, D.C.: The Sentencing Project. (pp. 1–4, 14–19). 130. ↑ National Research Council (2014), note 45 above (pp. 67–8). 131. ↑ Mauer, M. & Ghandnoosh, N. (2014). Fewer Prisoners, Less Crime: A Tale of Three States. Washington, D.C.: The Sentencing Project; Greene, J. & Mauer, M. (2010). Downscaling Prisons: Lessons from Four States. Washington, D.C.: The Sentencing Project. 132. ↑ See Sickmund, M., Sladky, T. J., Kang, W., & Puzzanchera, C. (2013). Easy Access to the Census of Juveniles in Residential Placement. Pittsburgh, PA: National Center for Juvenile Justice. 133. ↑ Mauer (2009), note 61 above. 134. ↑ Bureau of Justice Statistics (2010). Local Police Departments, 2007. (p. 14, Figure 9). 135. ↑ Pew Research Center (2014). Sharp Racial Divisions in Reactions to Brown, Garner Decisions. Washington, D.C; Blain, G. (2014). Nearly Two-Thirds of New Yorkers Believe Officer Daniel Pantaleo Should be Charged in the Death of Eric Garner: Poll. New York Daily News. 136. ↑ Editorial Board (2014). The Country Should Know How Many People Die in Police Custody. The Washington Post.